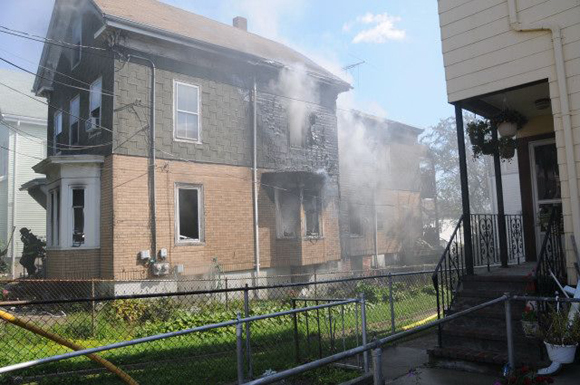 The following photos were taken at the 2nd Alarm fire at # 42 Browning Road on September 4th. 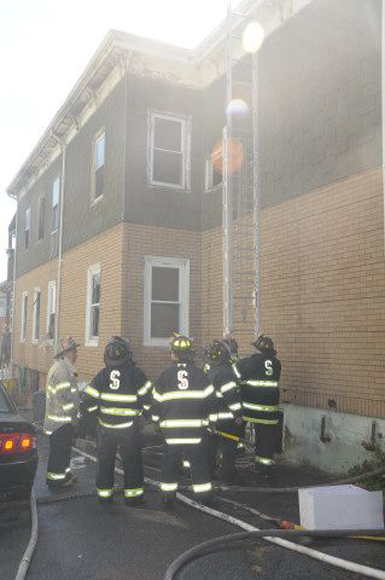 Group 4 was working. 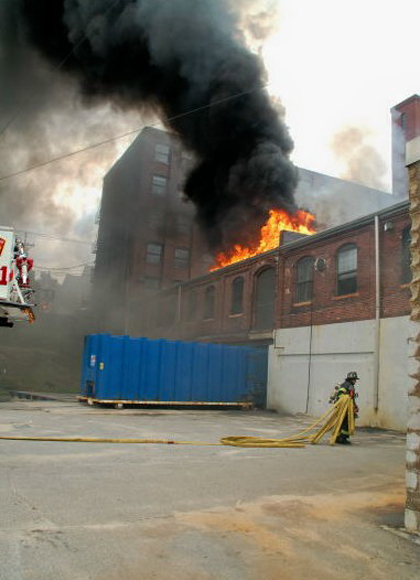 Firefighter Mark Wall stretching an attack line into the warehouse. 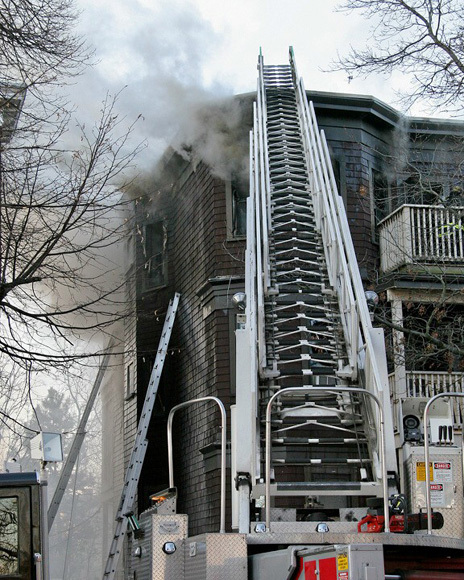 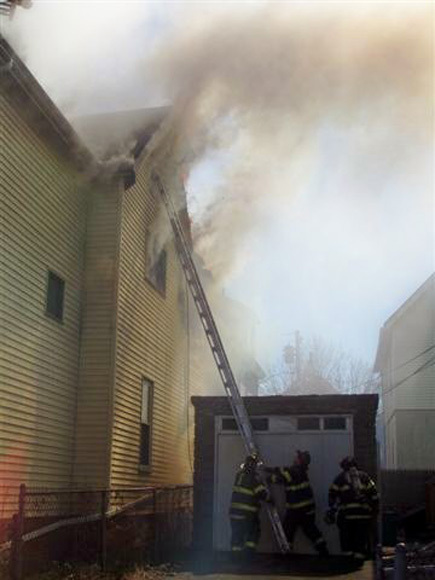 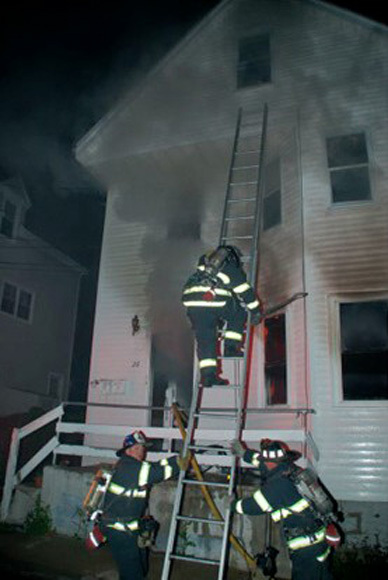 Ladder Two operating on the Harding Street side of the property. 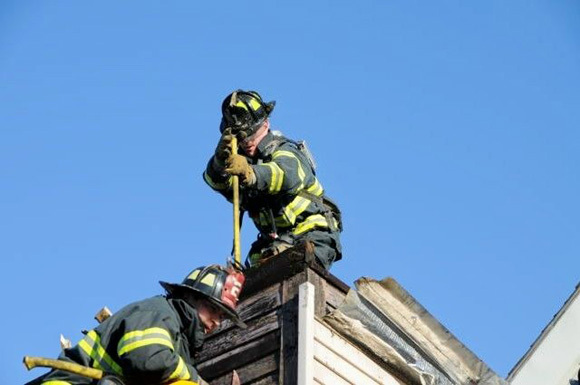 Captain John Norton and Ff Barry Hamilton preparing for some truck work on the fireground. 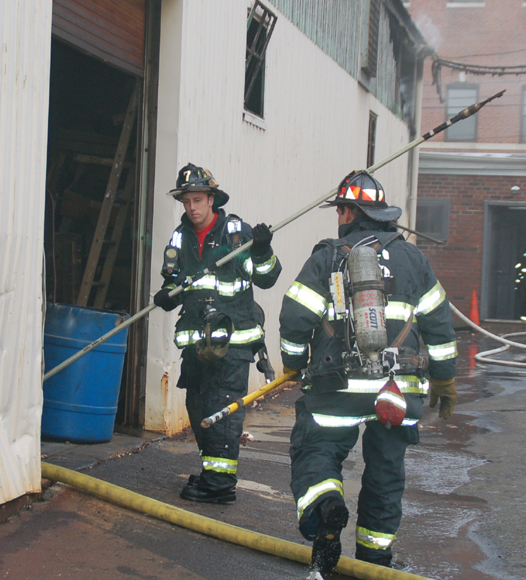 Firefighter Mike Marino bringing a "cathedral hook" into the warehouse in an effort to reach fire burning in the roof area. 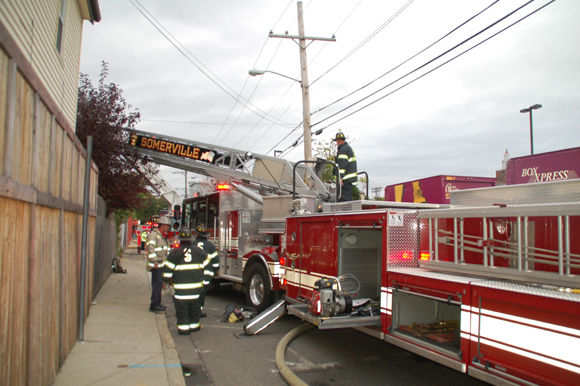 Engine Seven's line is stretched through the front door as Captain Bill Hallinan (L2) and his crew prepare to go to work. 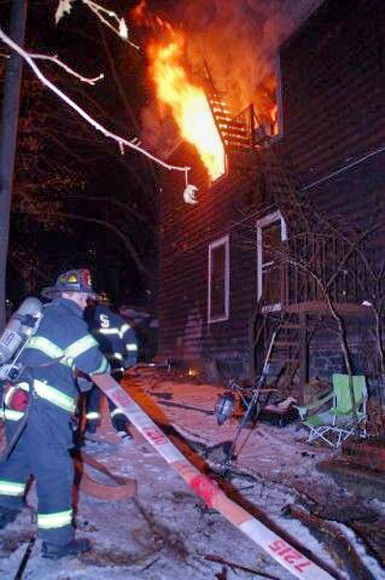 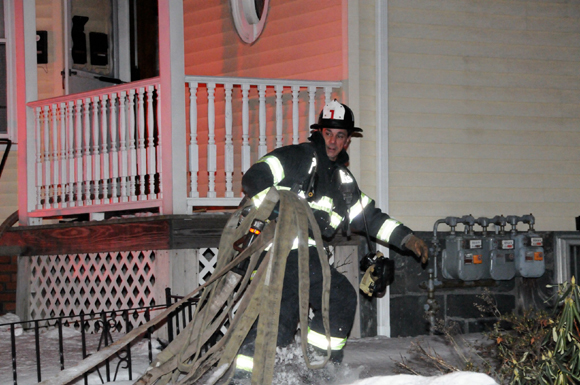 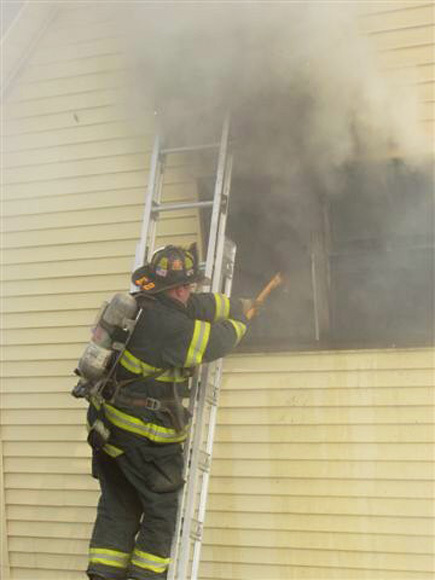 Lt. Charlie Houghton (working on Engine 1) advances an attack line to the rear of the building. 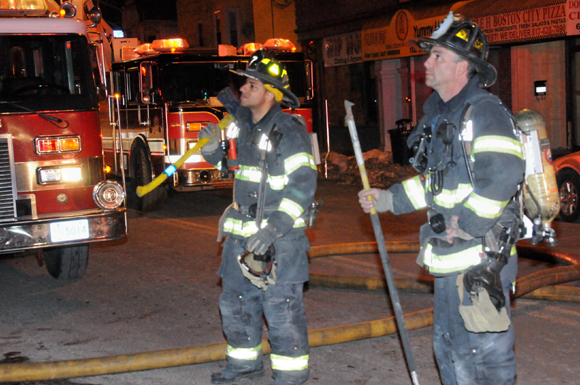 Firefighter Julian Davis and Lt. Dan DiPalma stand by on Highland Avenue as part of the assigned RIT (Rapid Intervention Team). 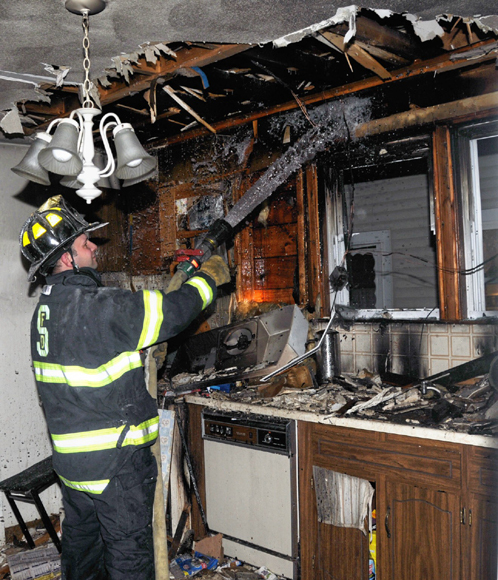 Firefighter Derek Nolan (E7) completes overhaul of the heavily damaged kitchen. 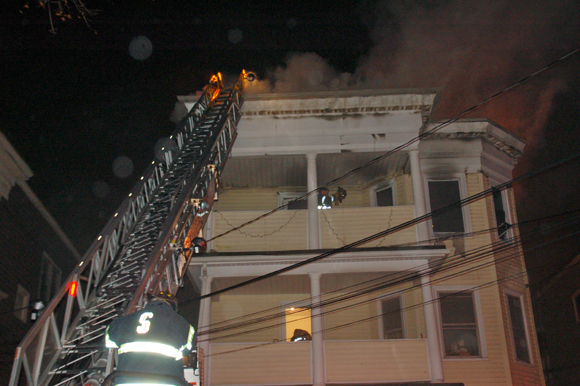 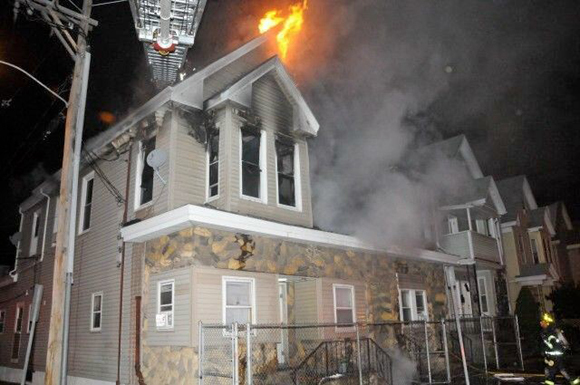 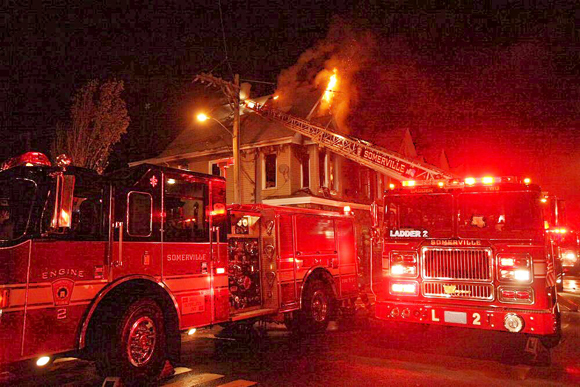 Flames rip through the roof of # 37 Lewis Street during the early morning hours of November 14th. 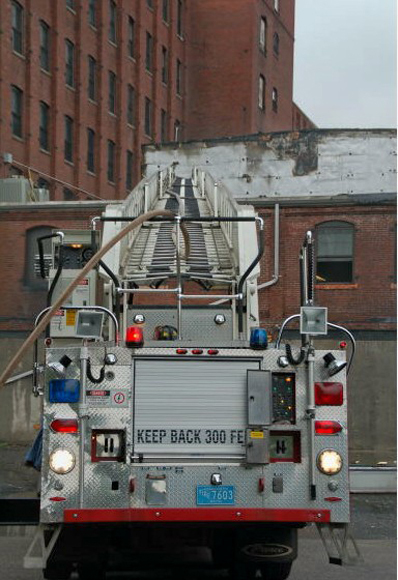 Ladder 2 was able to get a great shot to the front of the triple-decker. 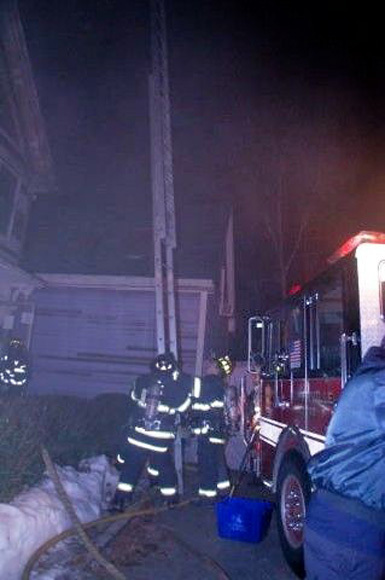 Ladder 2's stick to the roof. 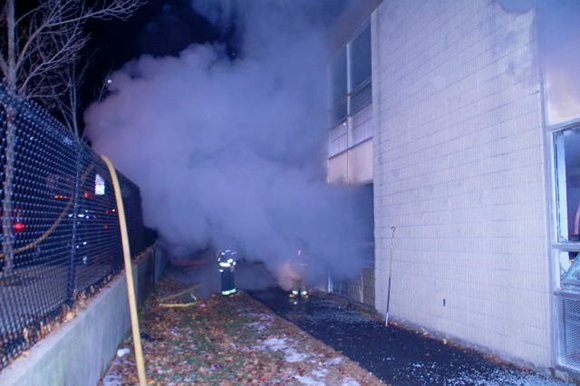 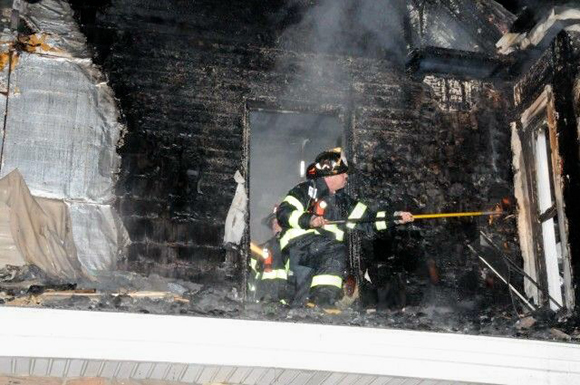 Deputy Chief Dave Salvi checks on the fire on the bravo side of the building. 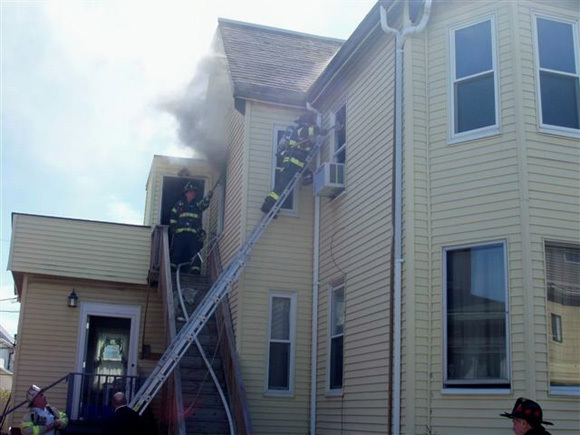 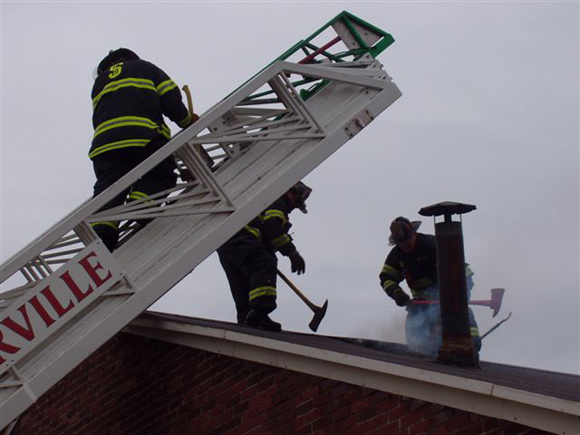 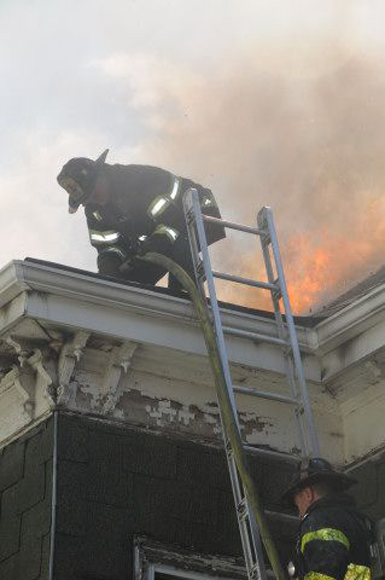 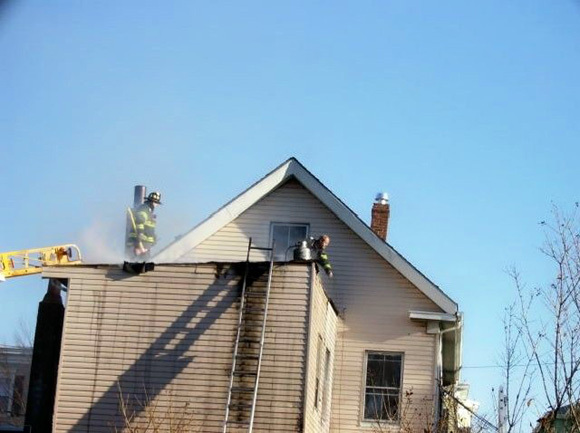 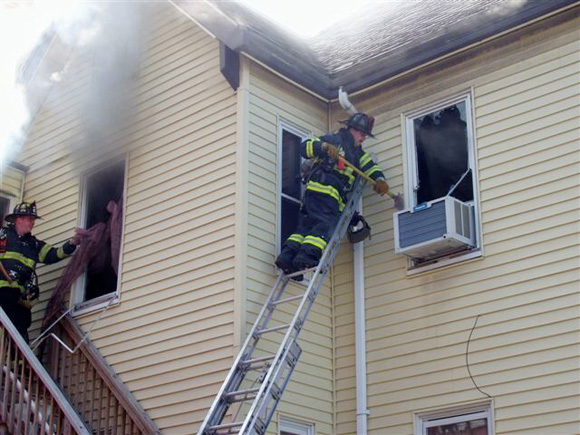 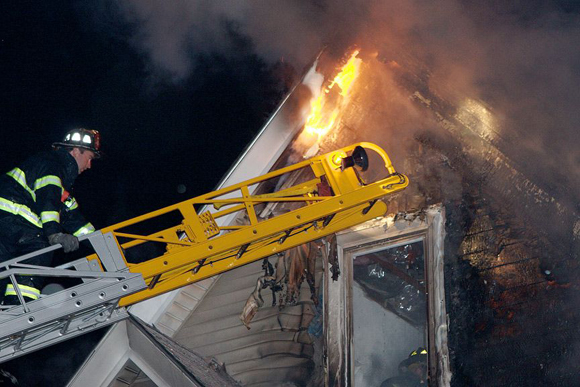 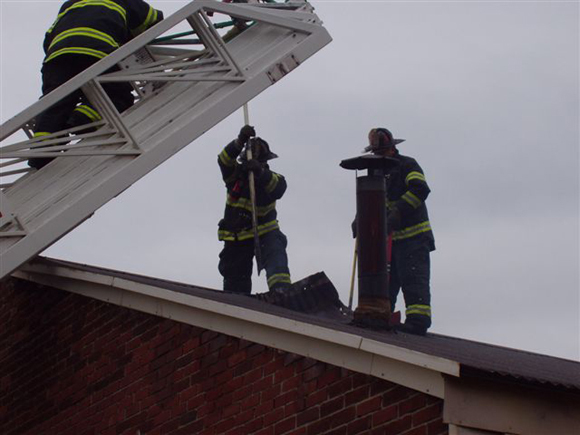 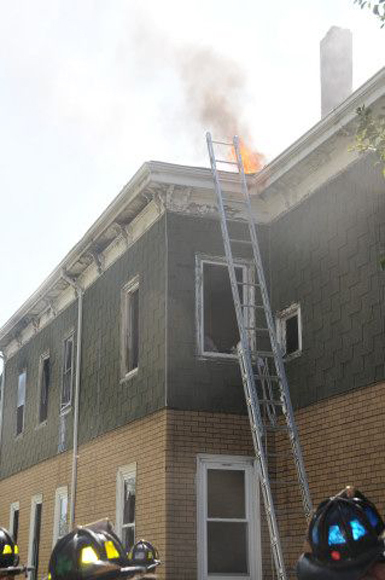 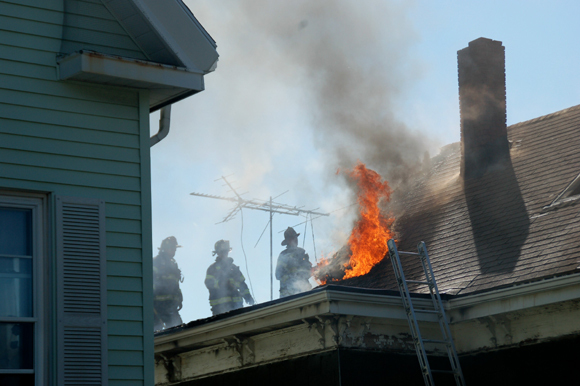 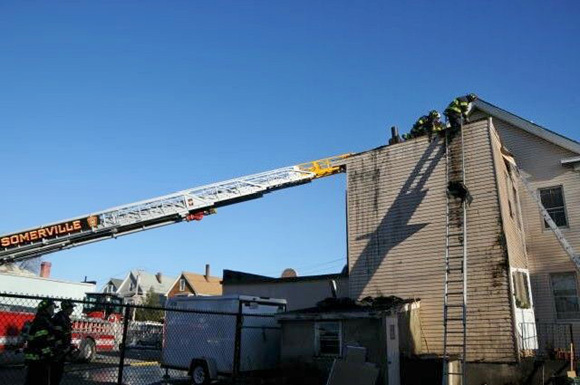 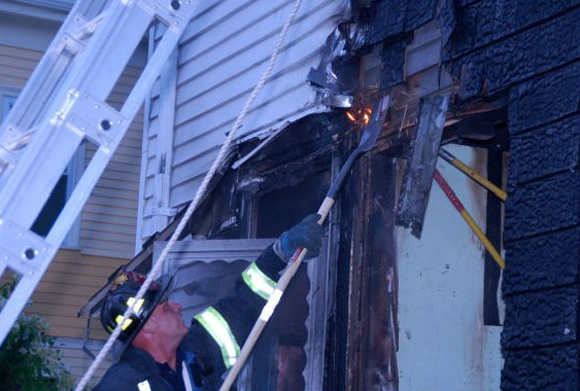 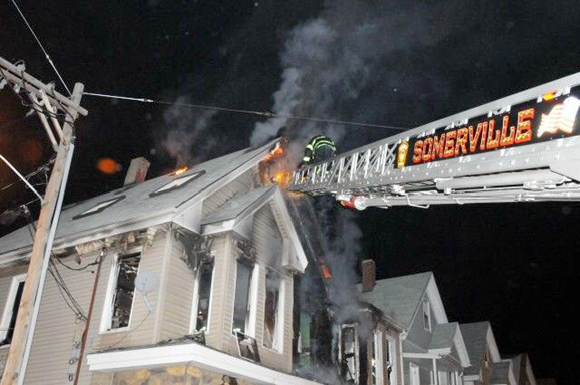 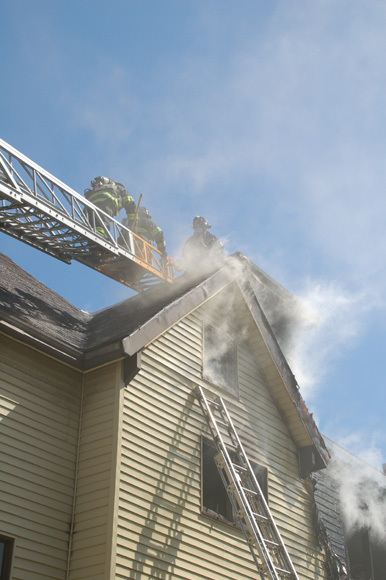 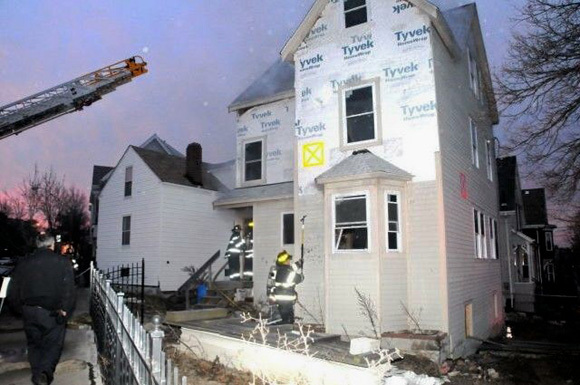 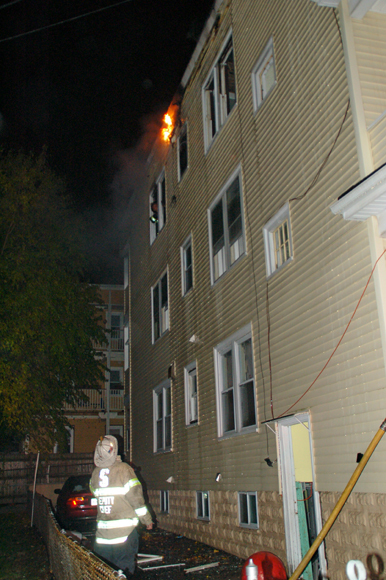 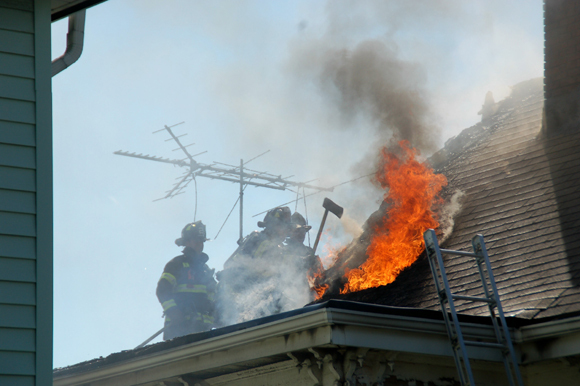 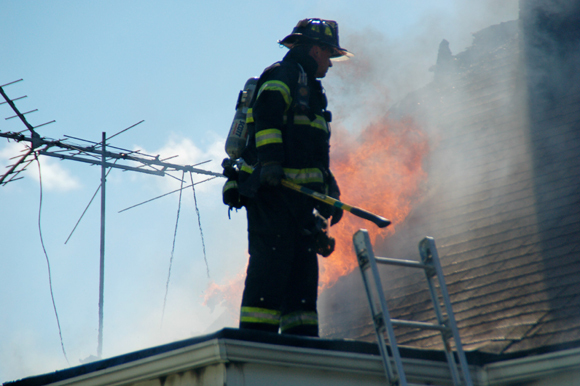 Captain Charlie Breen knocks down the exterior fire along the roof line. 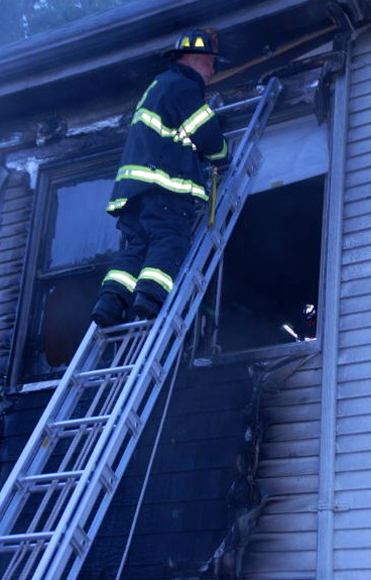 Engine 2 and Ladder 2 were first due to the 2 alarm flick at the corner of Cross St. and Bonair St.
Firefighter Billy Costa of Ladder 2 checks for fire extension on the exterior of the house near the roof. 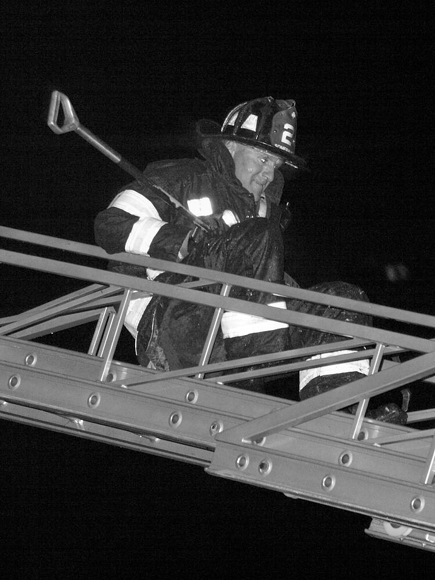 Firefighter Chris Howard climbs down the stick of Ladder 2. 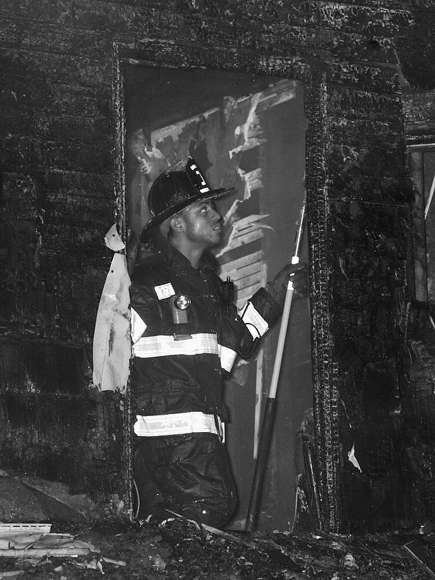 Firefighter Melvin Dominique overhauls the interior of the 2nd floor looking for hot spots. 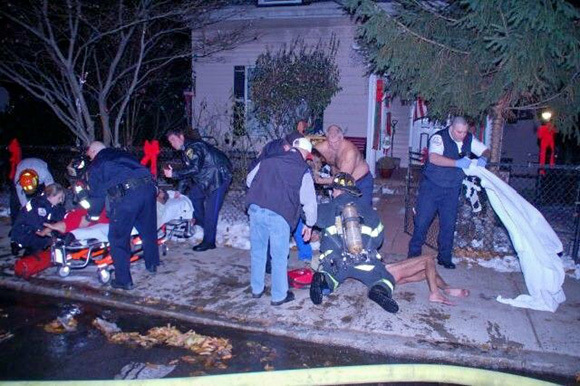 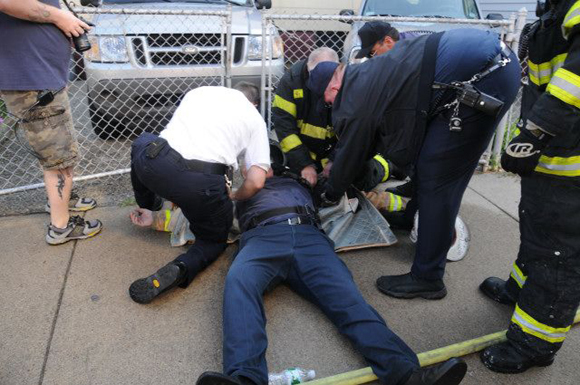 Deputy Chief Steve Keenan receives medical attention after he collapsed at the fire scene. 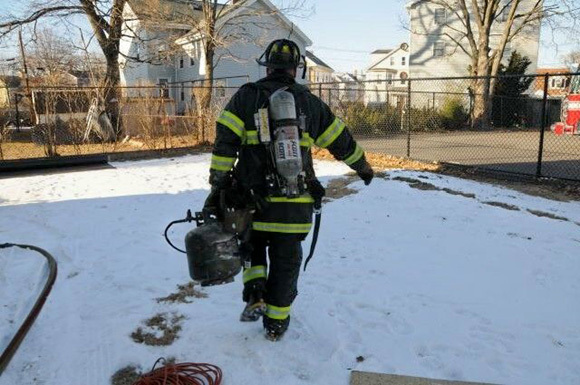 Ff Dave Stiltner (E6) assists his crew in advancing a second line off Engine 4 which was operating with the spare pump at the time of the fire. 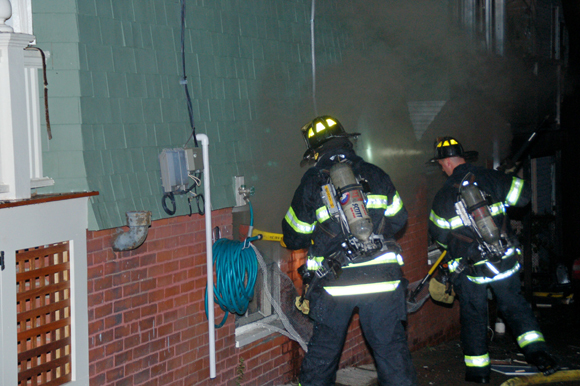 Firefighters advance into the basement to extinguish fire spreading across the ceiling and extending up into the first floor apartment. 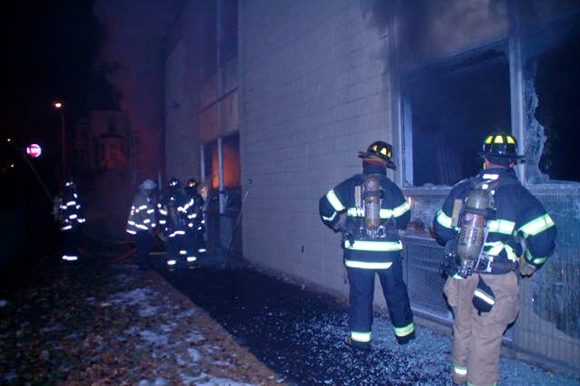 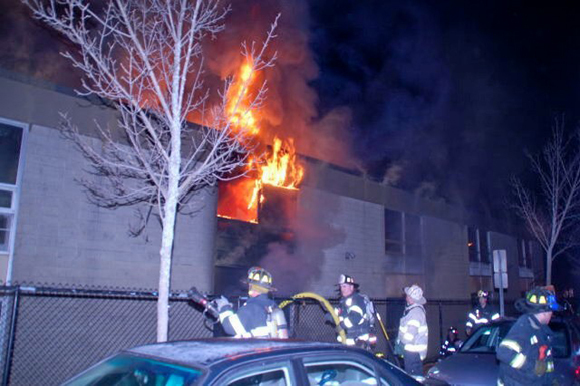 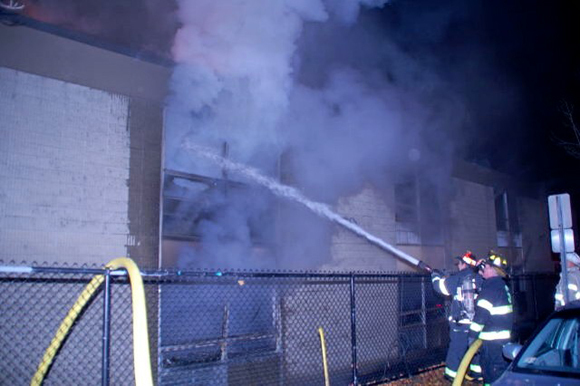 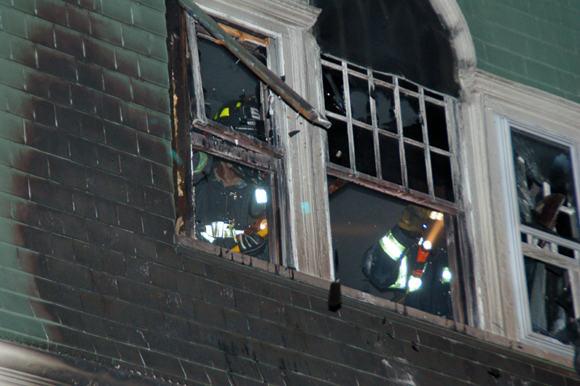 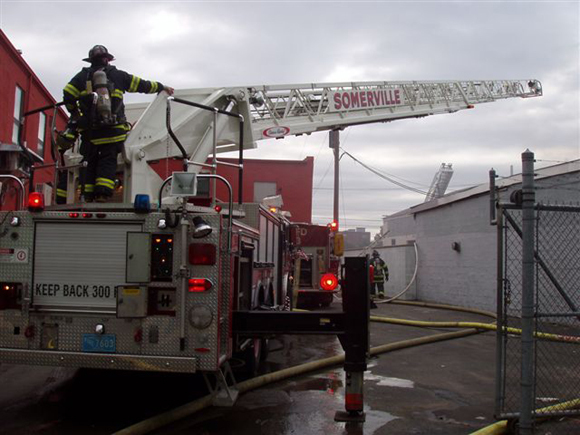 Members of Group 4 work to attack and ventilate fire involving the first and second floors of the East Somerville Community School in the early morning hours of December 9, 2007. 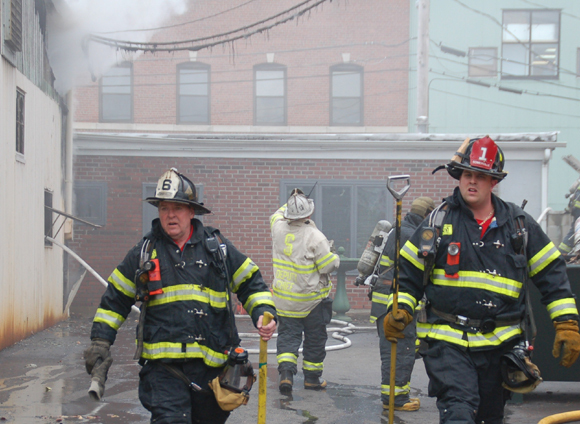 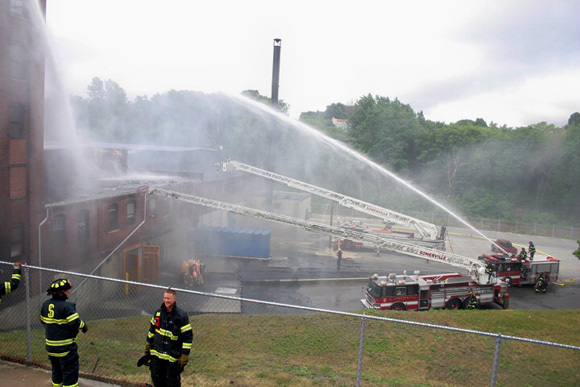 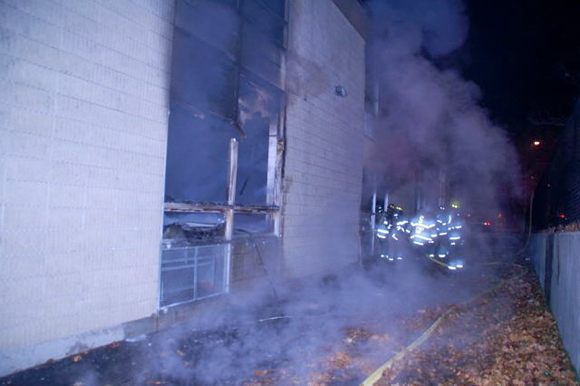 Lt. John Byrne of Engine 2 advancing a line into the school. 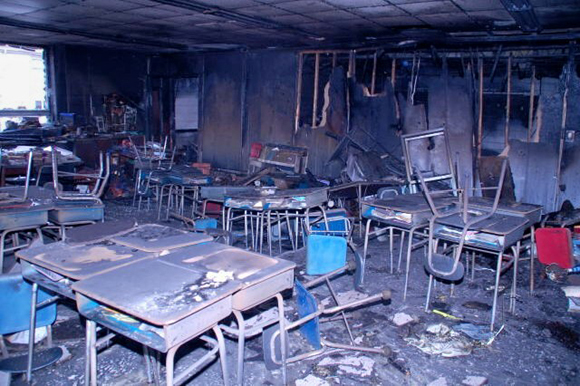 Room #108 on the first floor where the fire is believed to have originated shows total devastation. 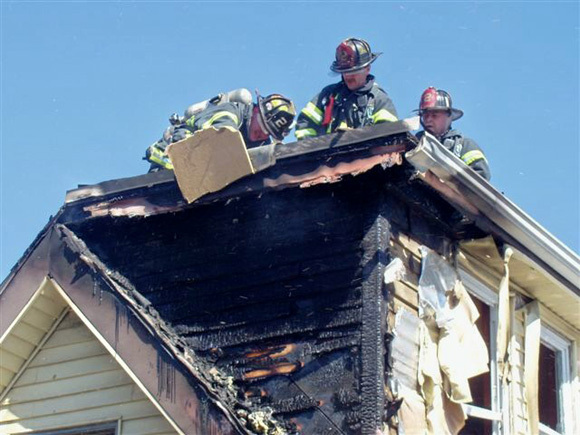 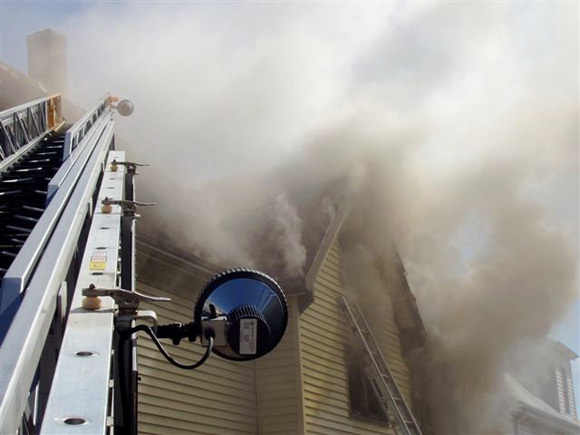 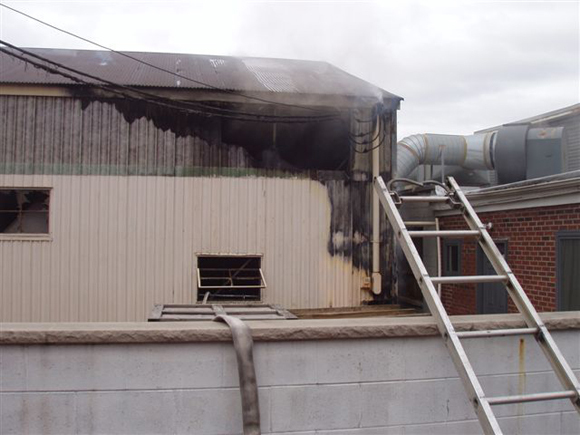 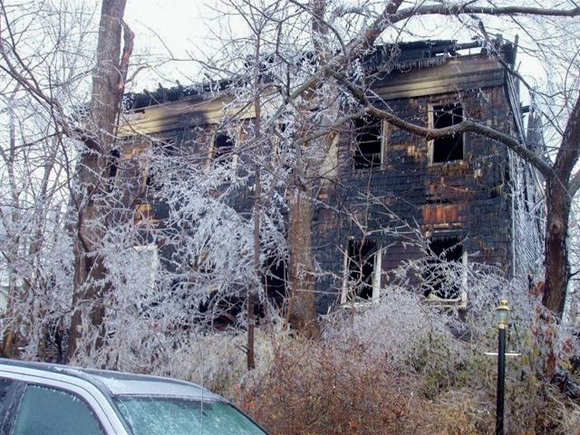 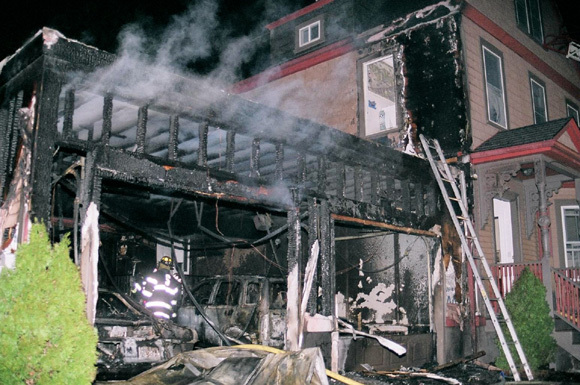 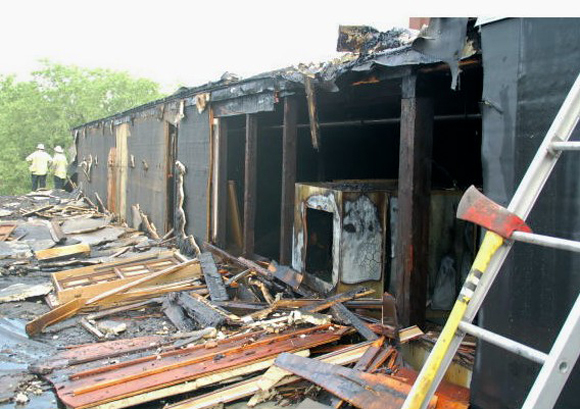 Extreme heat from the fire resulted in failure of the steel bar joists and metal decking of the second floor. 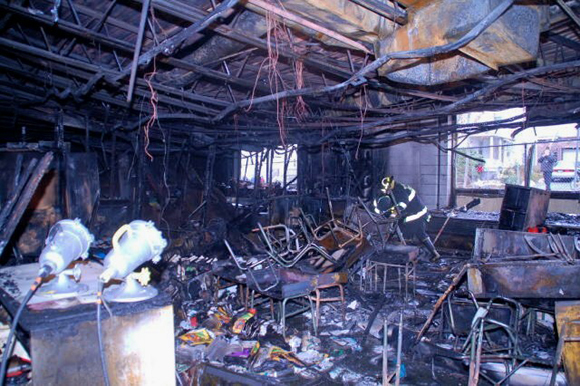 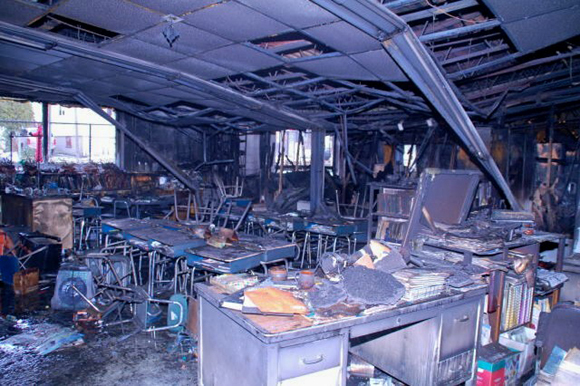 A view of Room #106 where fire spread from the adjacent room. 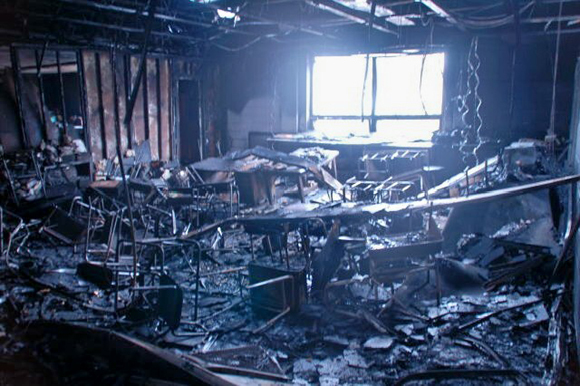 Room #208 on the second floor. 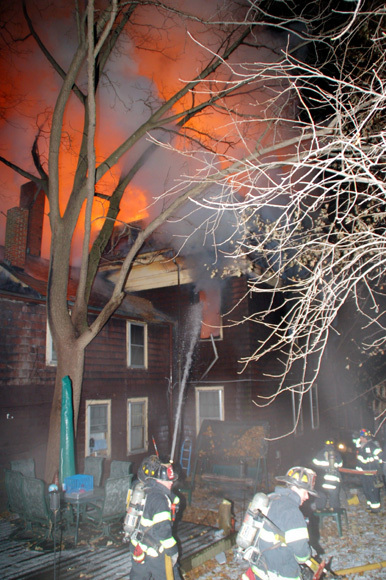 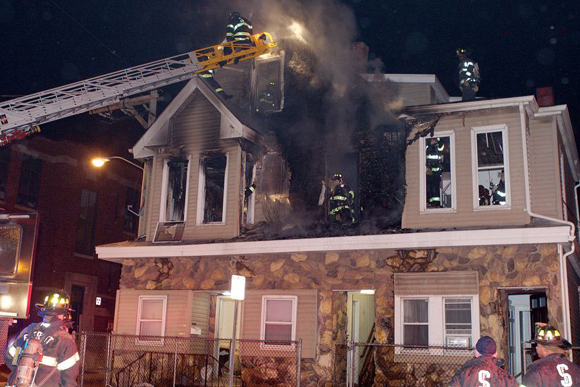 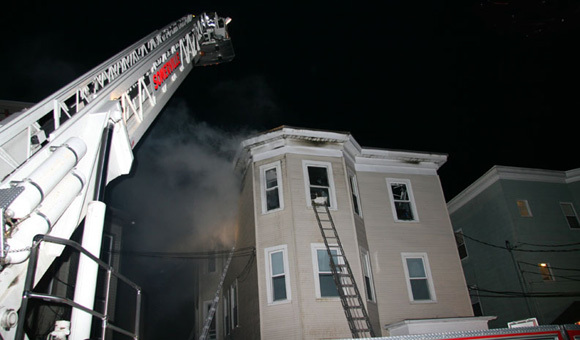 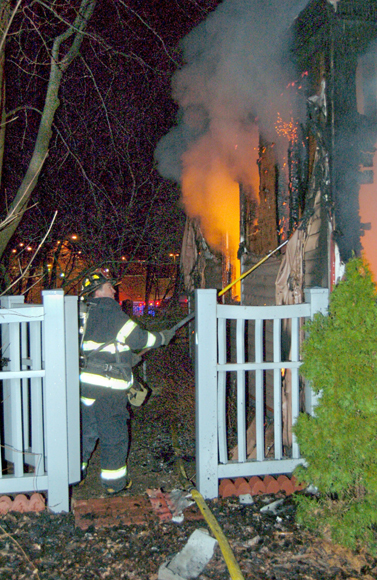 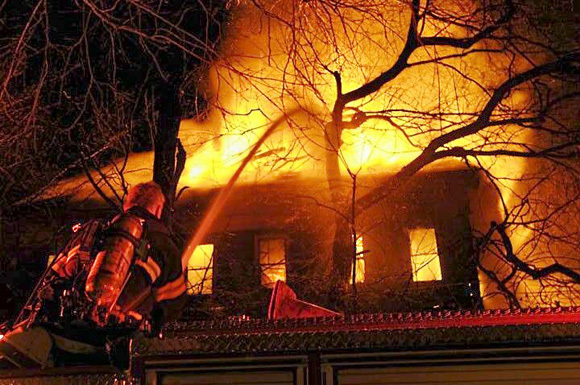 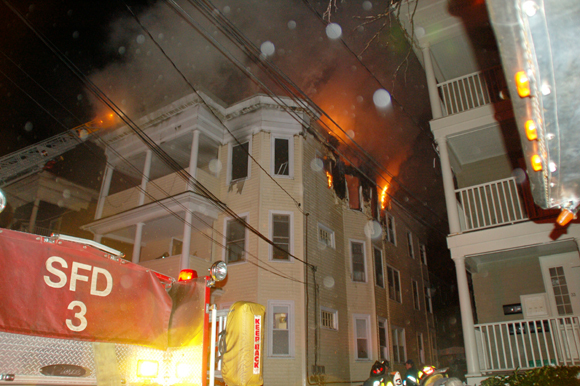 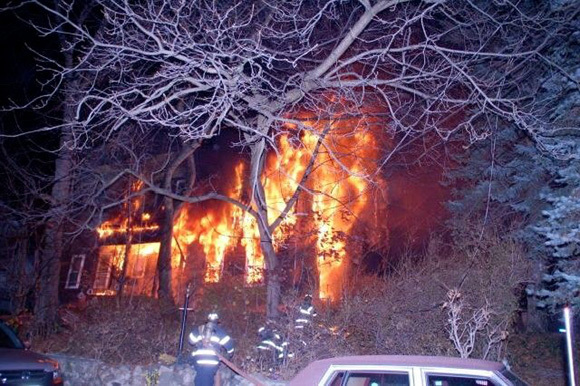 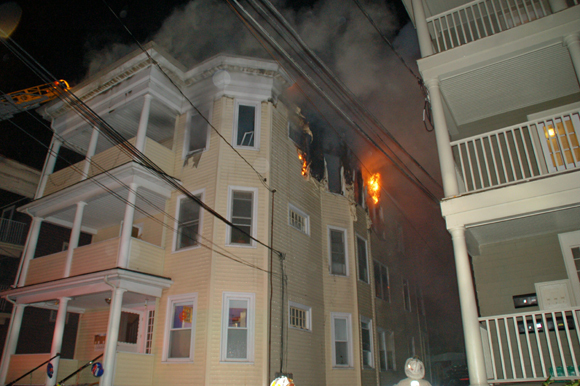 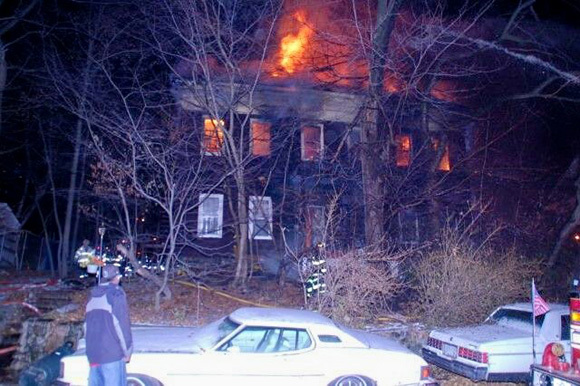 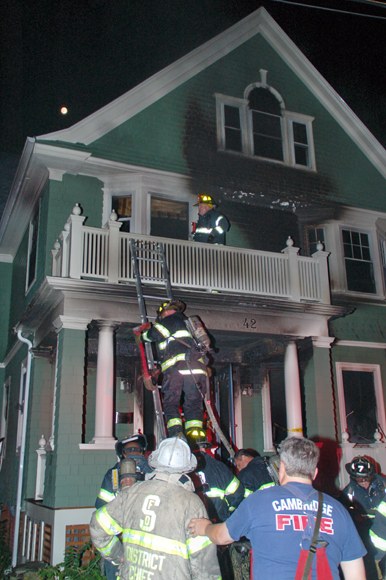 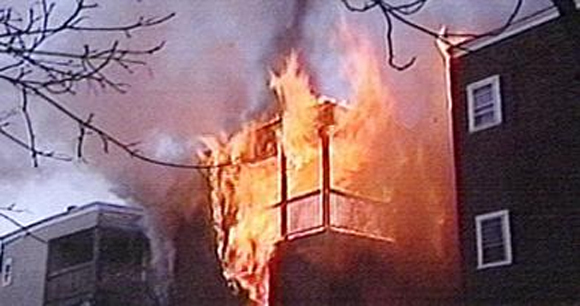 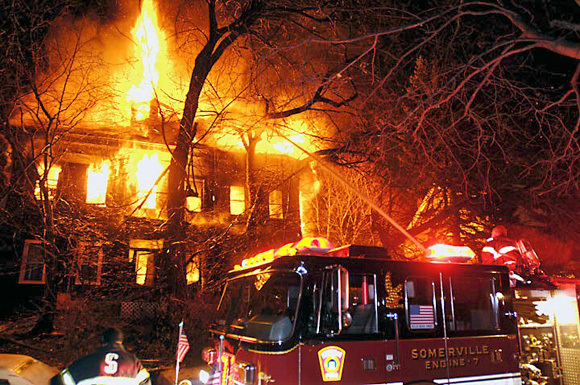 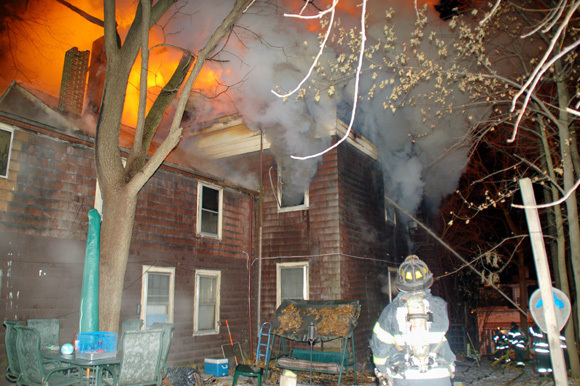 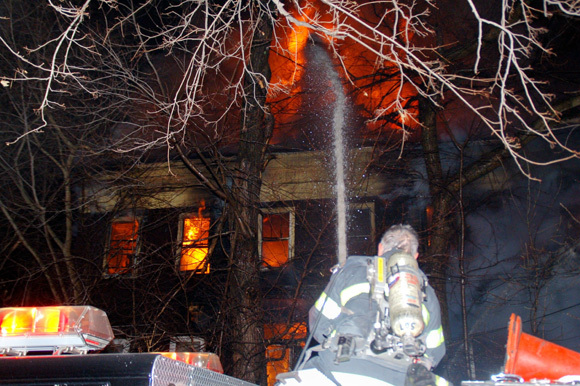 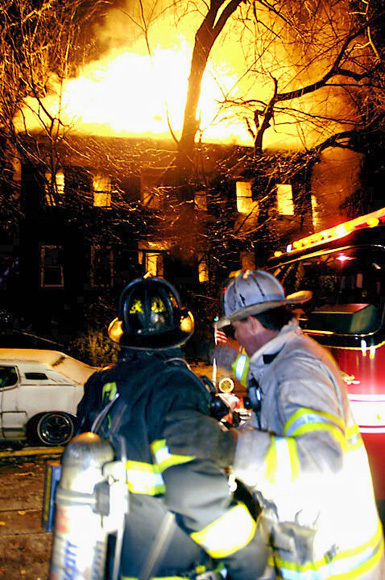 Heavy fire engulfs the occupied 2 1/2 story duplex at 11 Harvard Place on the evening of December 6, 2007. 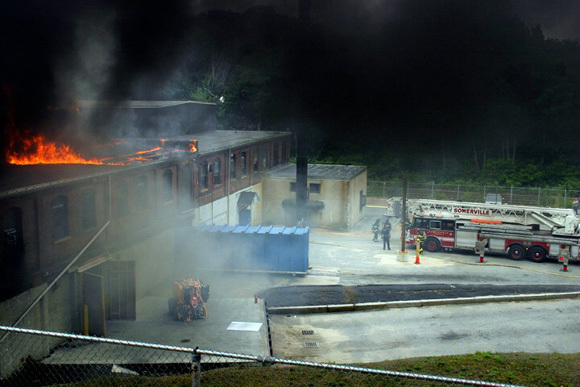 This photo by Jim Swanton shows the first attack line being stretched and the heavy fire conditions first arriving companies were met with. 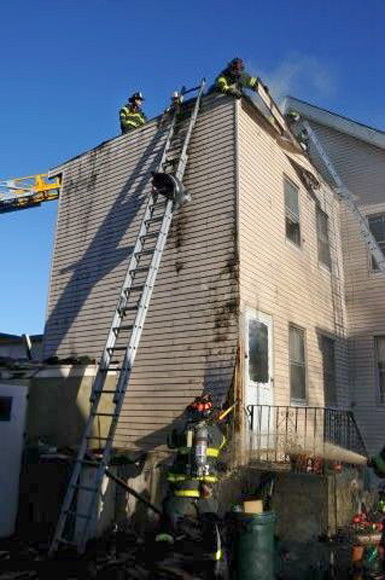 At the same time, search and rescue operations were underway at the rear of the building to remove two unconscious victims. 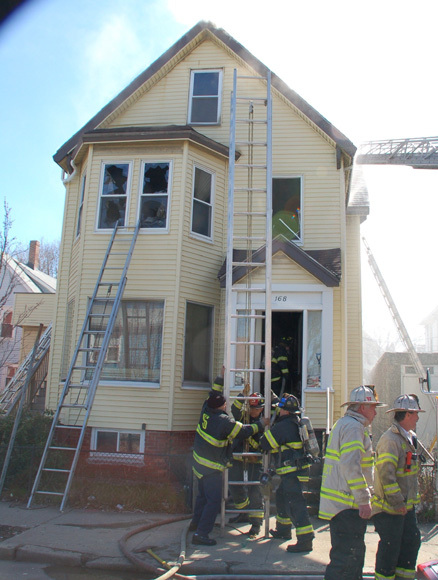 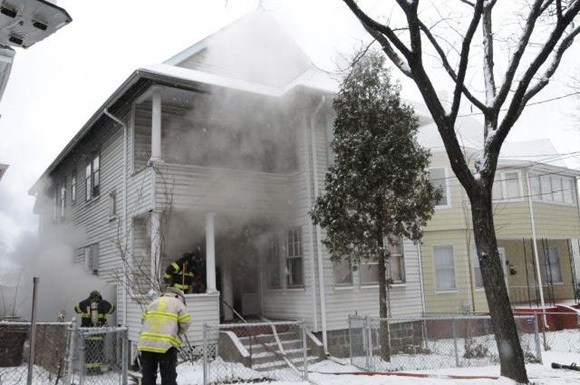 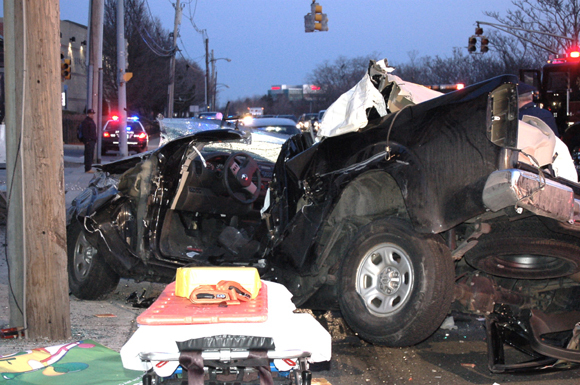 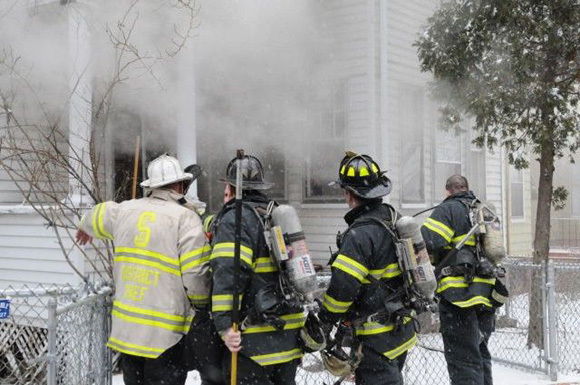 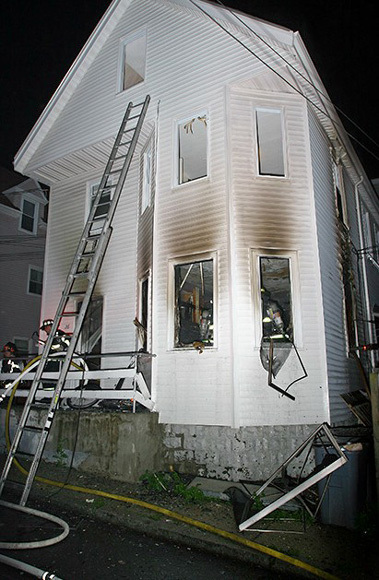 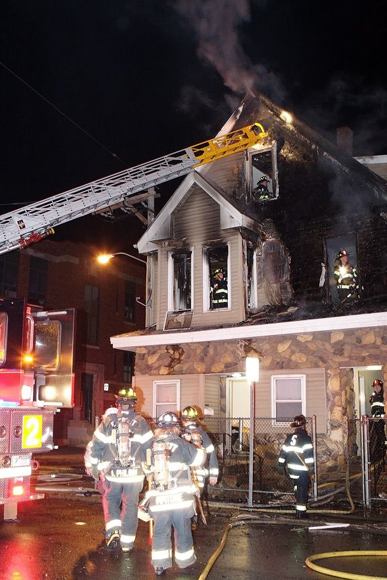 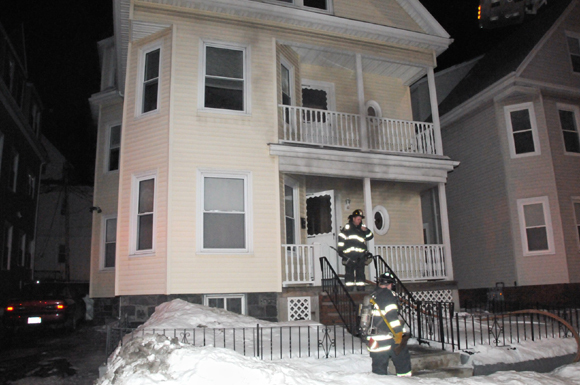 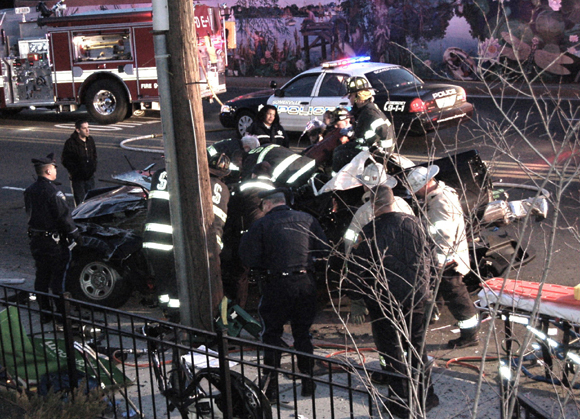 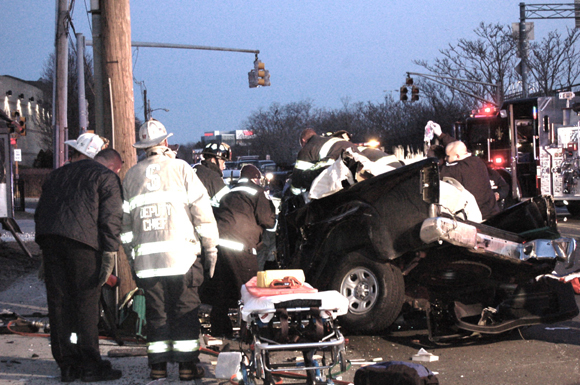 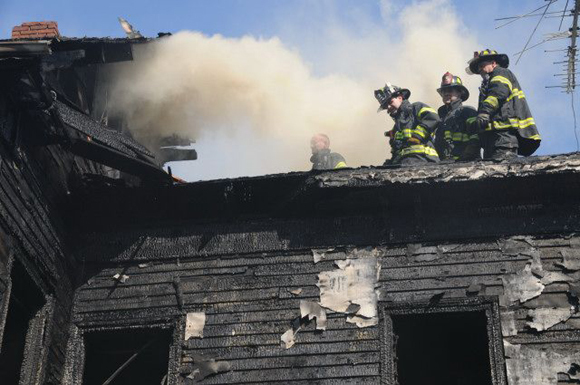 At the time of the first alarm, the SFD was stretched thin with companies working a multiple injury auto accident at Mystic Avenue and Temple Street and companies just clearing a one room fire at 73 Perkins Street all in the east end. 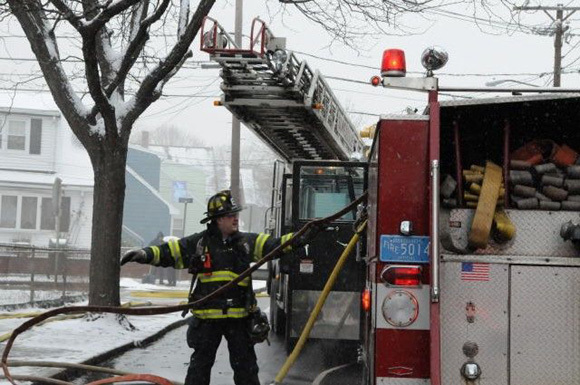 As usual, Engine Four was out of service. 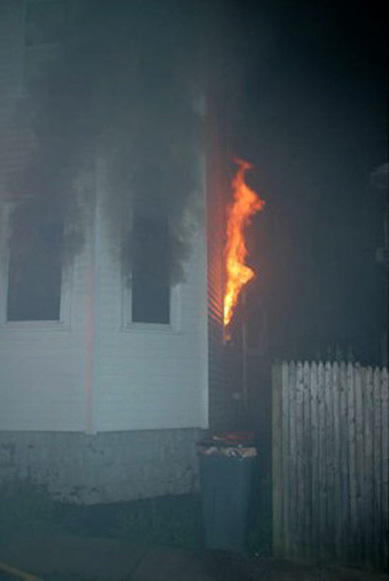 Fire conditions on the "D" side shortly after arrival. 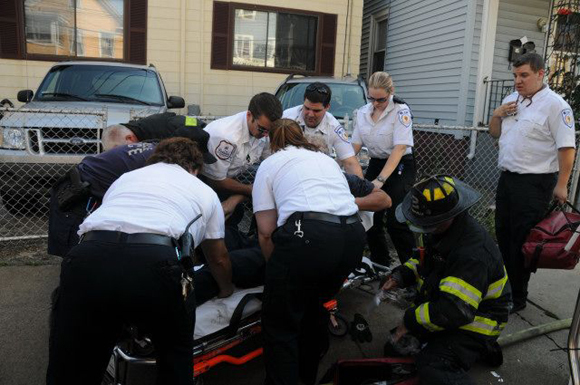 "FIGHT FOR LIFE" Firefighters, Police and Cataldo EMS work to revive both victims after their rescue from the first floor of the blazing home. 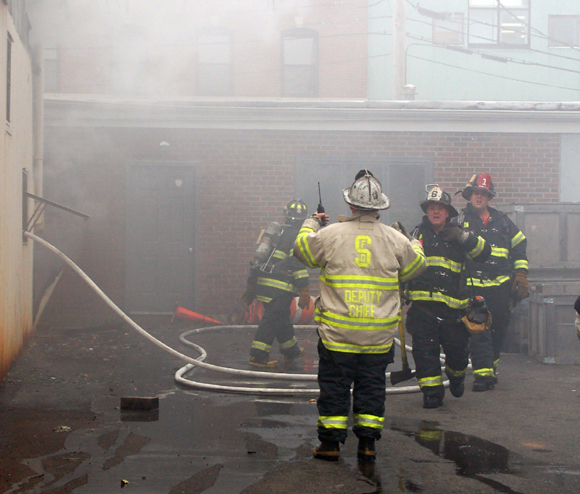 Ff Dave Alfano stretches a big line into position as heavy fire vents out the "B" side of the building. 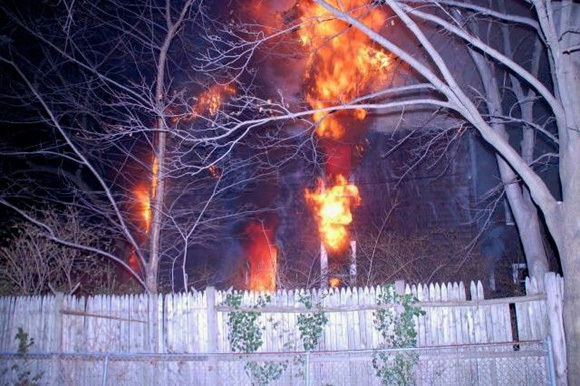 Fire consumes the duplex in this photo taken from the rear of the structure. 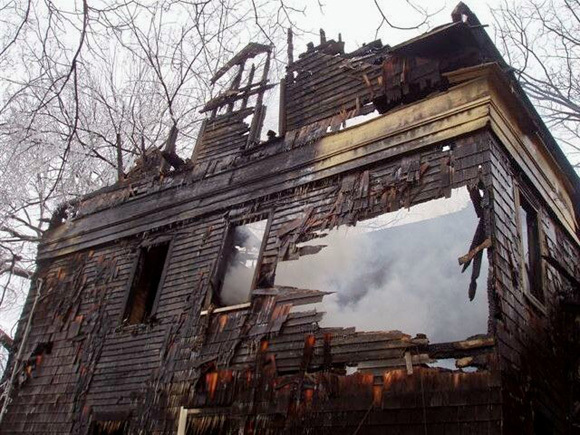 The house was built in the 1840's. 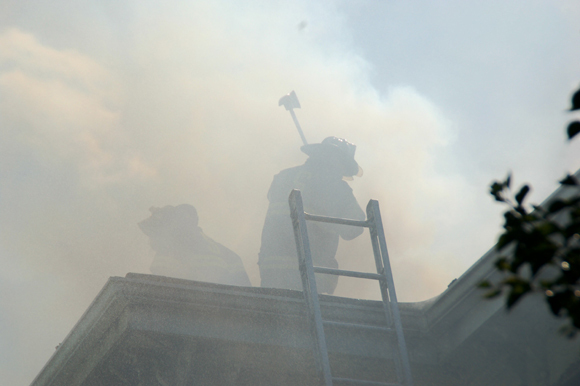 THROUGH THE ROOF - Heavy fire conditions break through the roof. 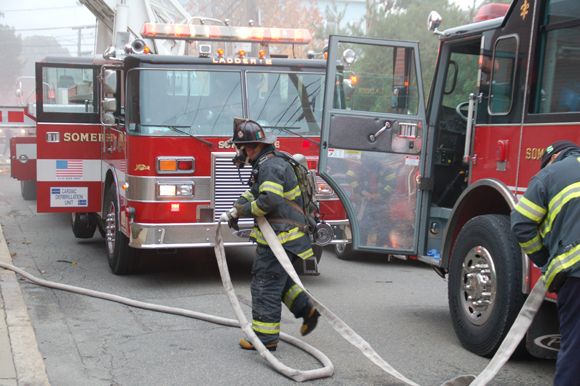 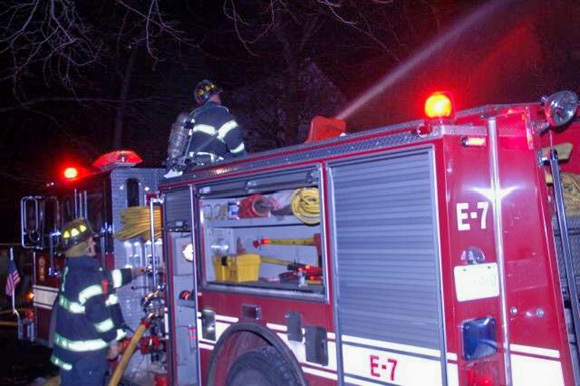 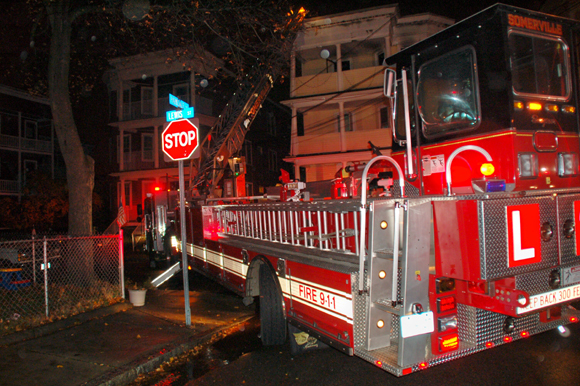 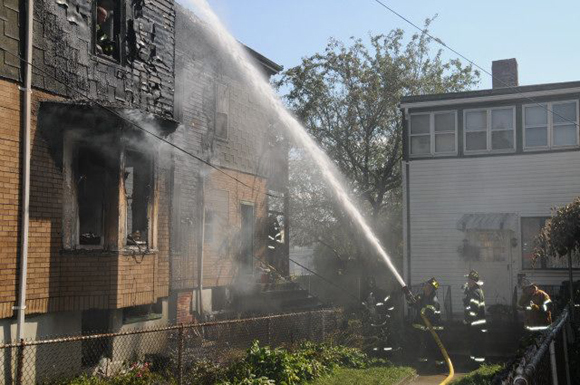 Engine Seven goes into a deck gun from the street in front of the dwelling. 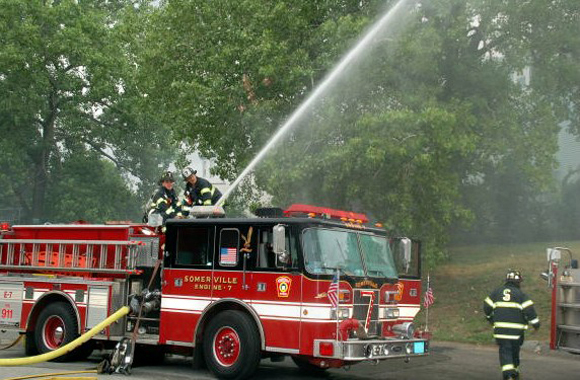 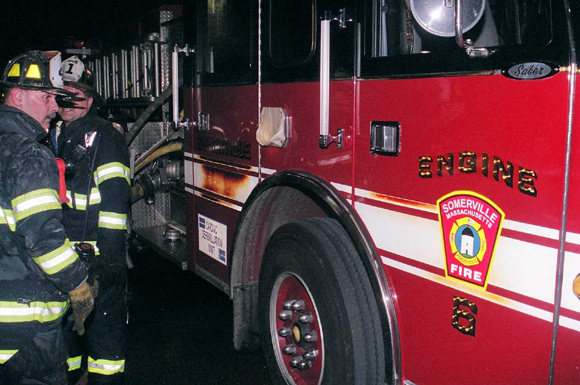 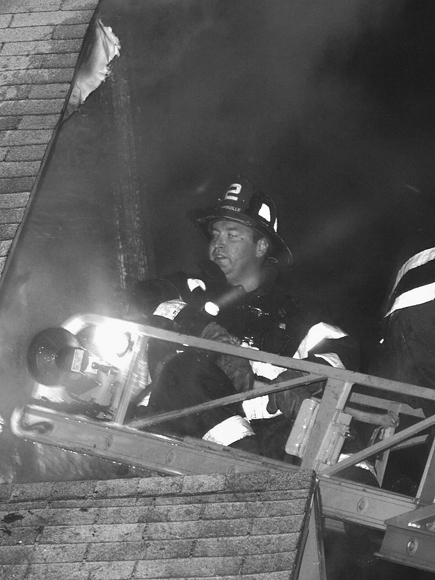 Ff Joe Rossi operates the pump while Ff Jim Powers operates the deck gun. 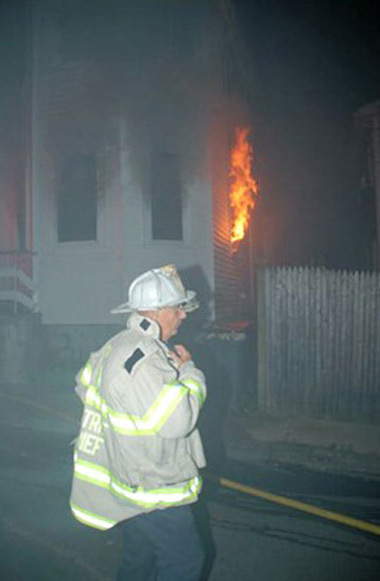 Deputy Chief Jim Lucia sends out orders on the fire ground. 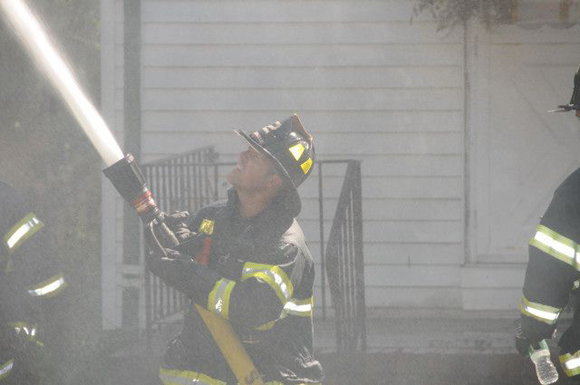 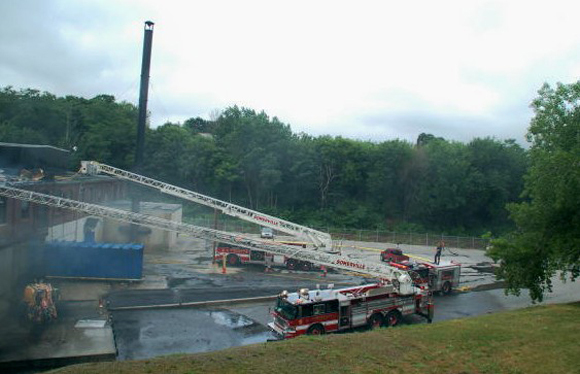 Engine Seven and Ff Jim Powers operating "the gun" . 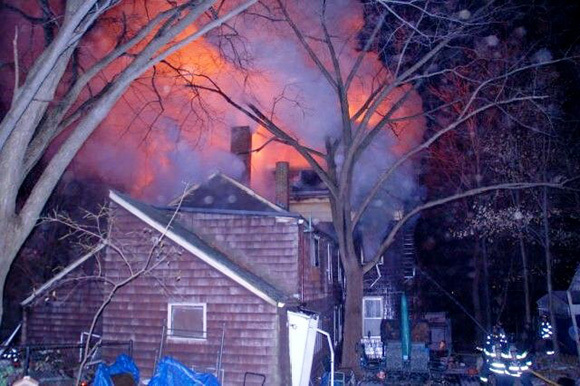 A view from the rear of the building. 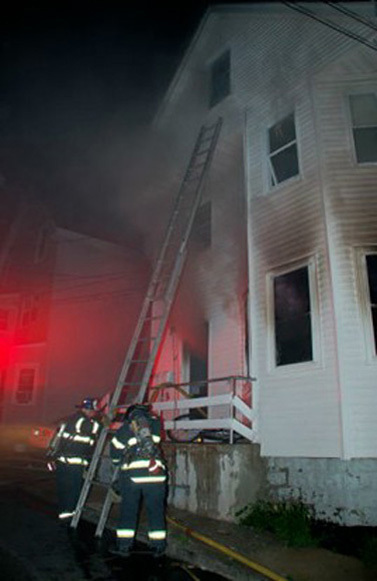 The door shown is where Ff Sly Moore crawled into the first floor to rescue an unconscious male victim. 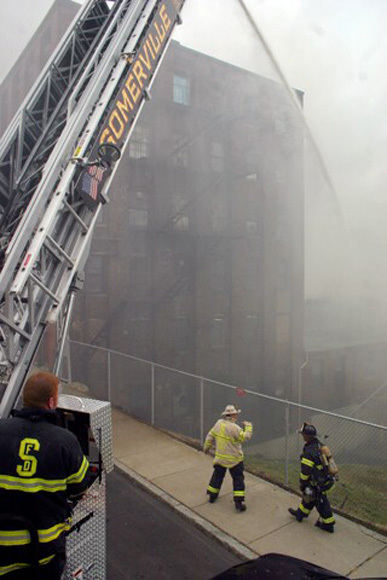 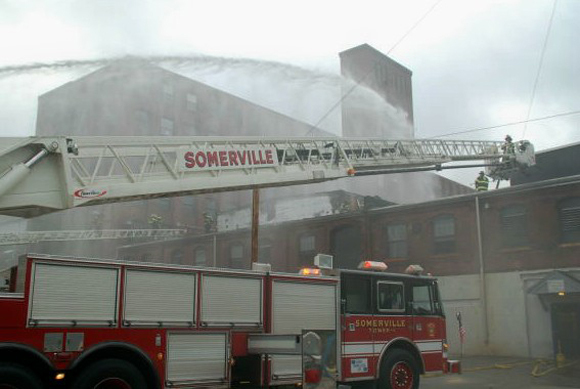 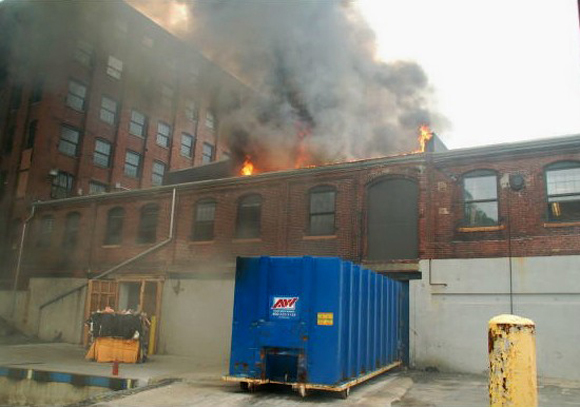 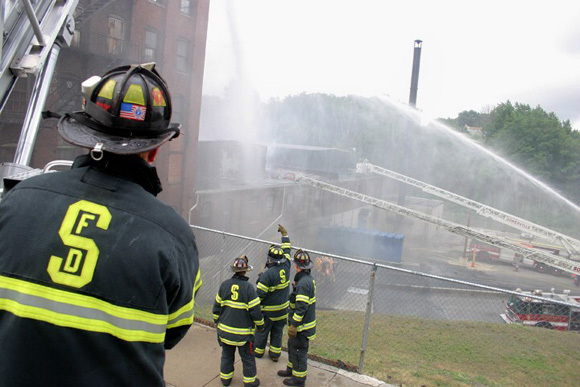 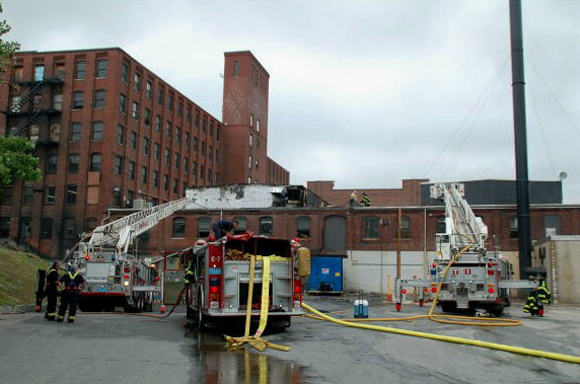 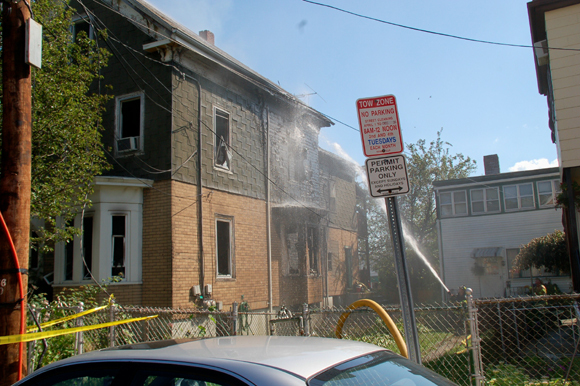 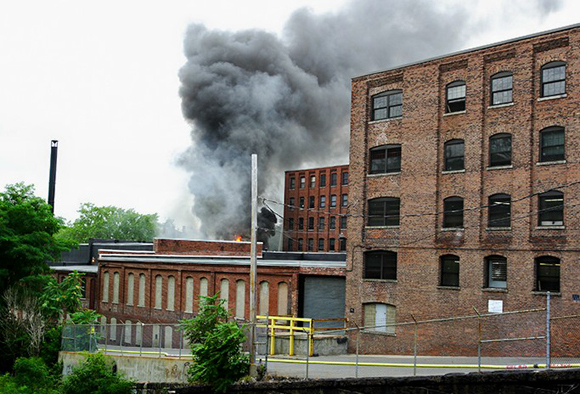 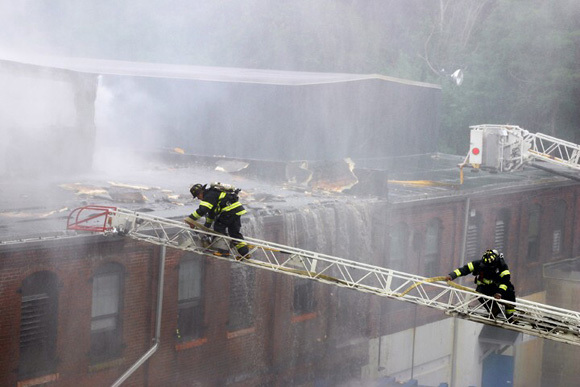 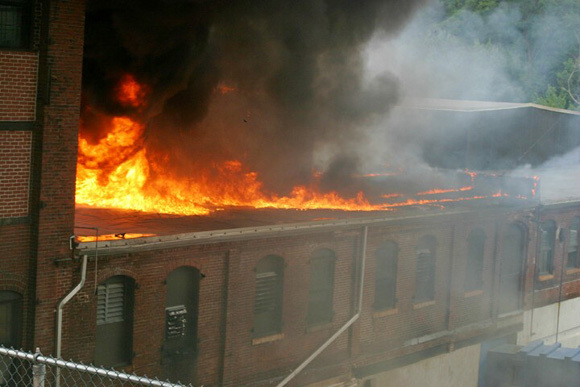 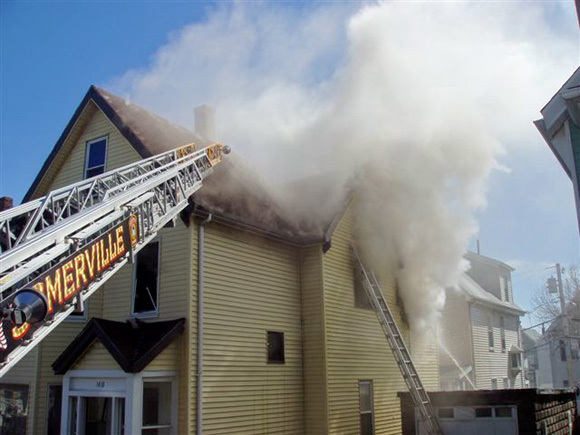 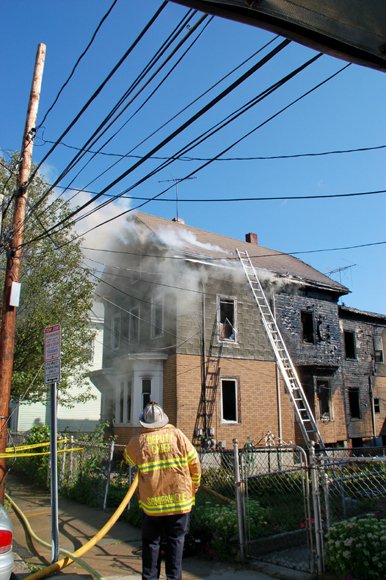 The following photos were taken at the 1 Alarm Fire at # 98 Central Street on September 1st, 2007. 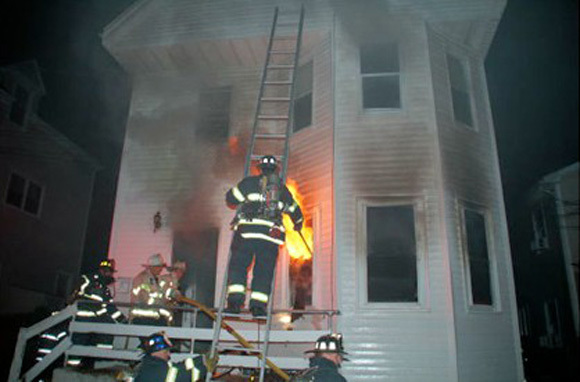 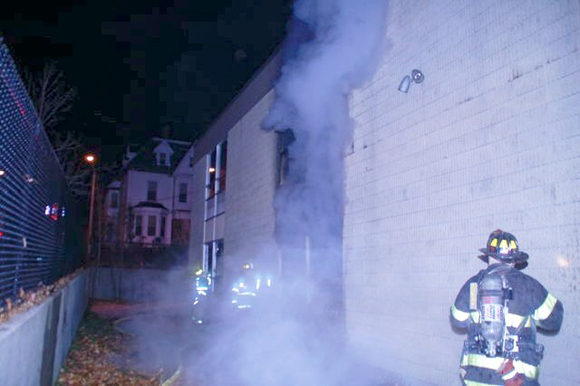 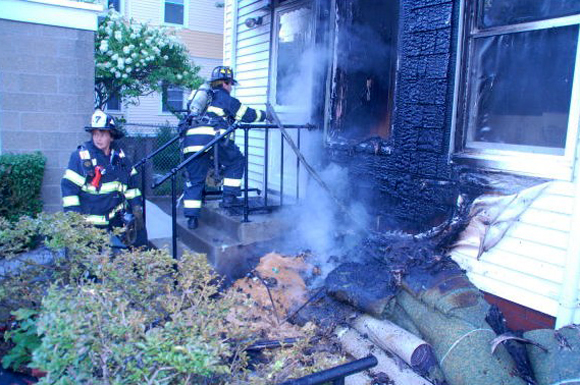 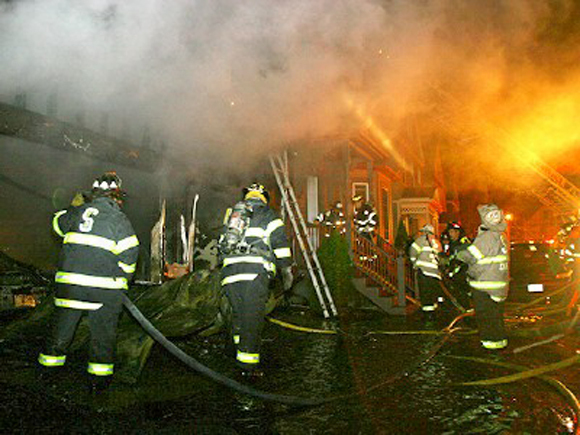 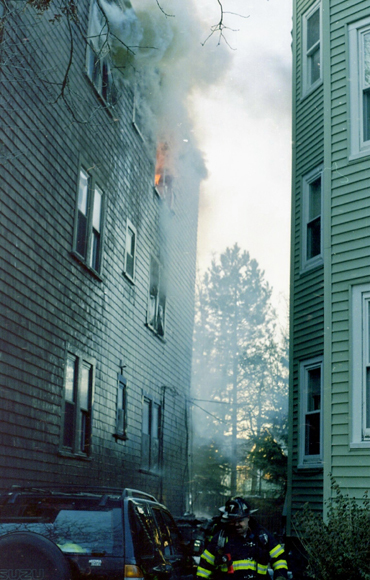 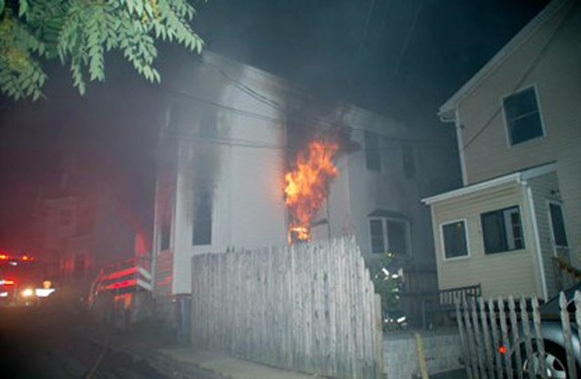 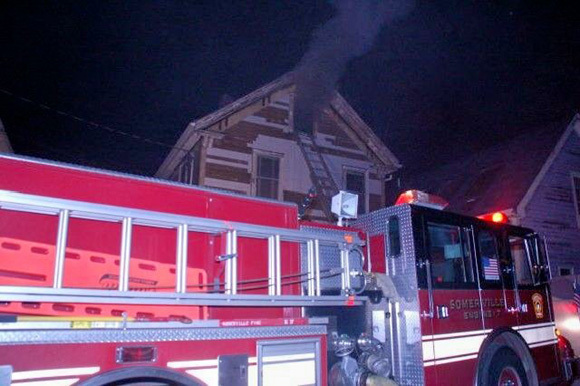 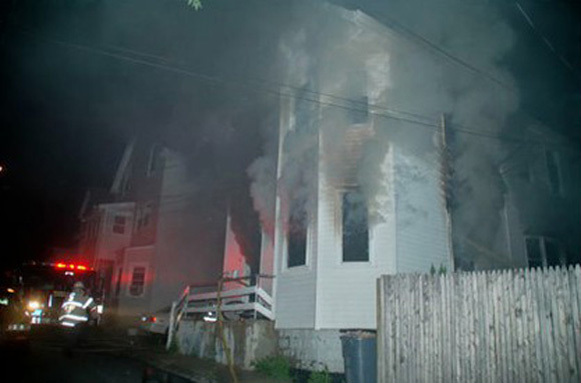 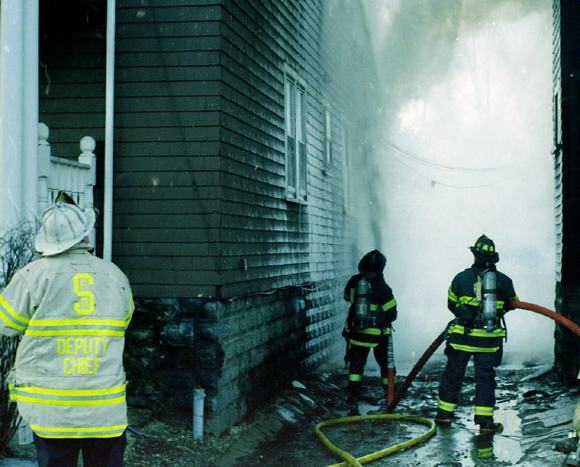 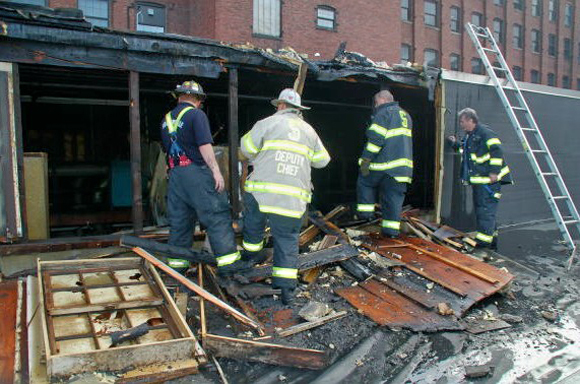 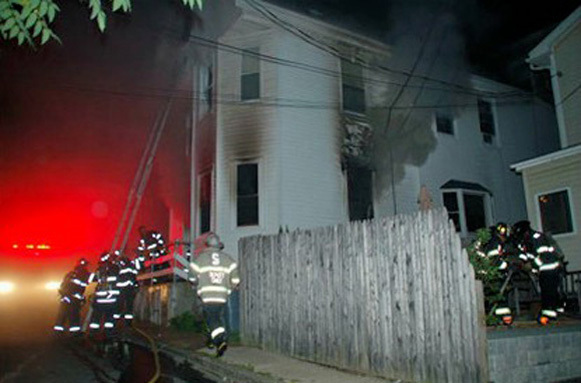 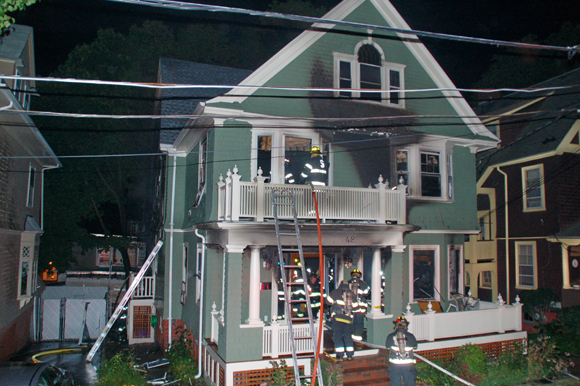 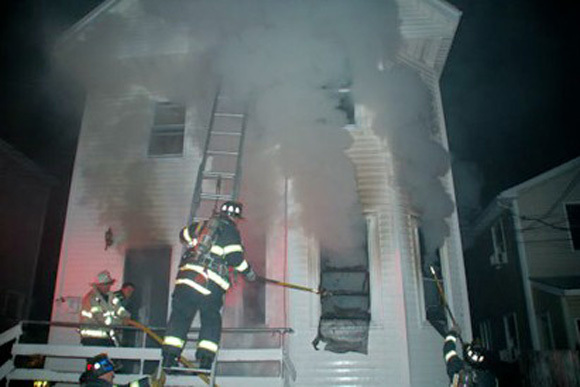 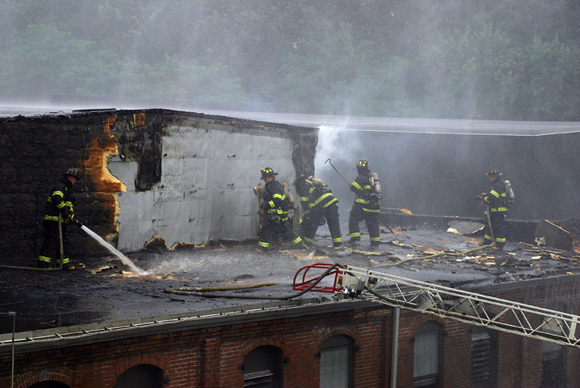 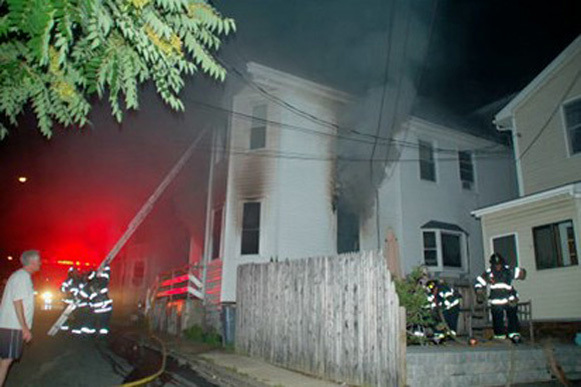 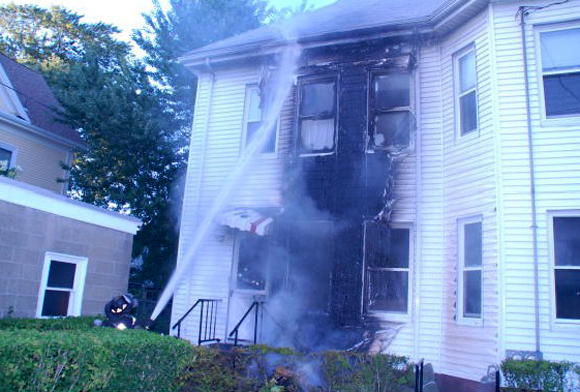 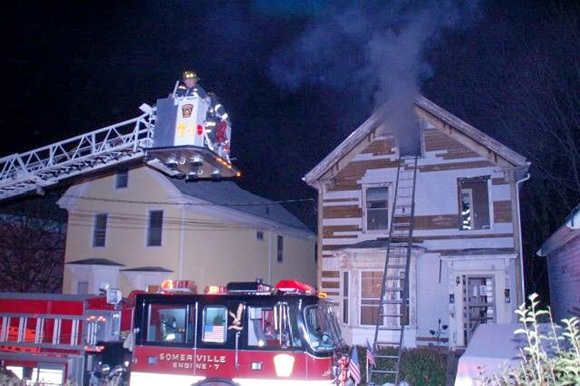 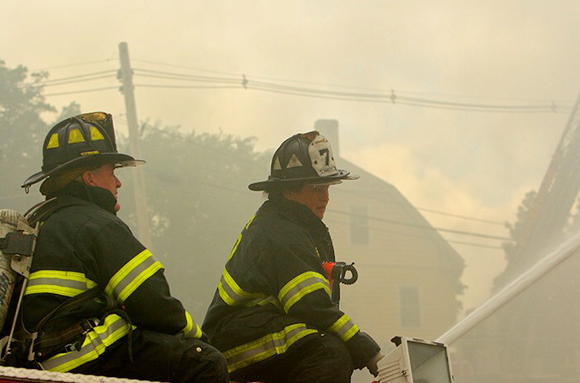 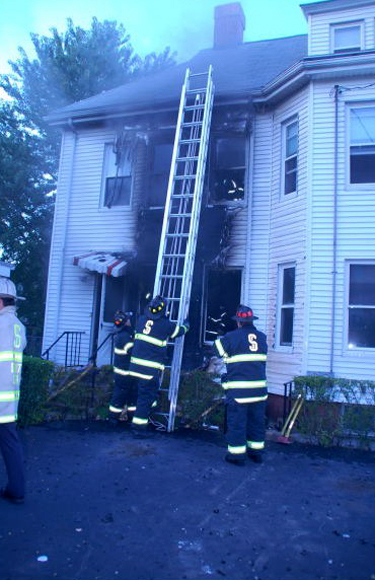 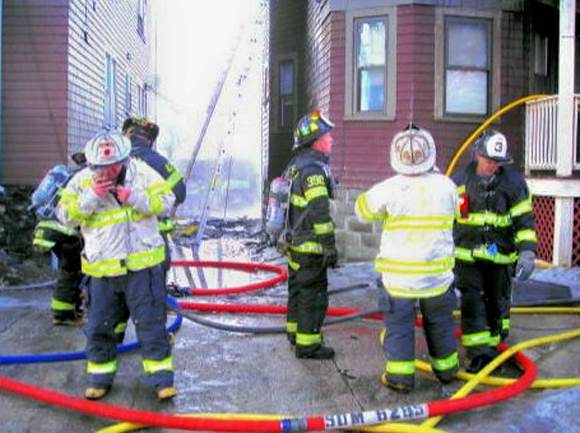 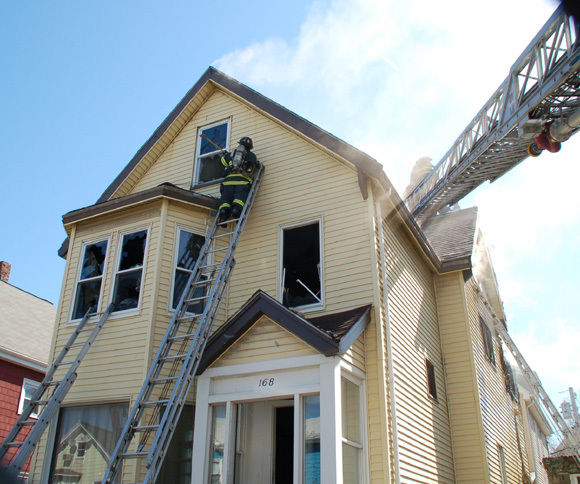 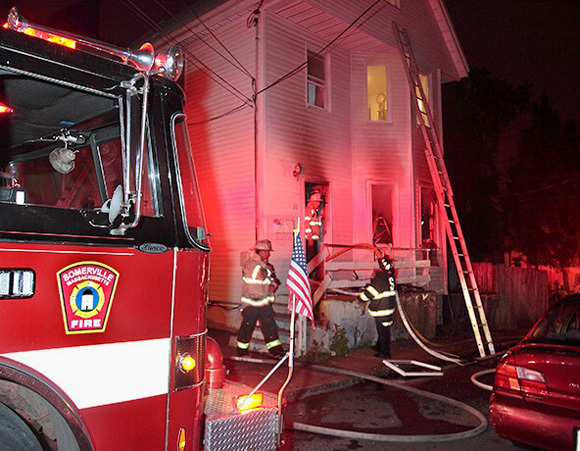 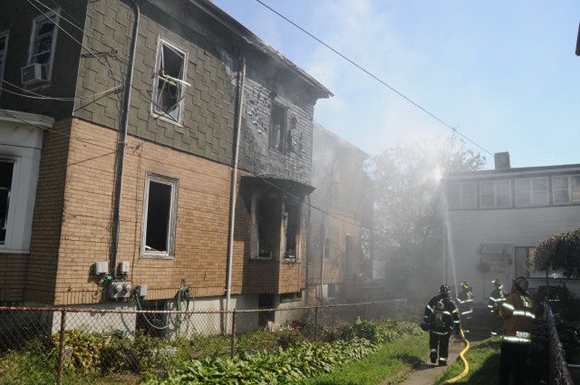 Lt. Leslie Rentel of Engine 7 darkens down exterior fire at 98 Central Street on September 1, 2007. 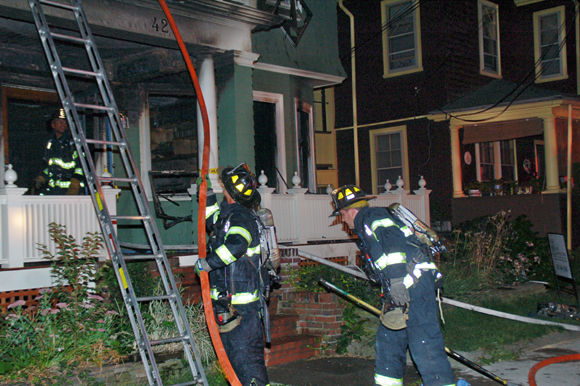 An outside rubbish fire extended up the exterior and into both floors of the unoccupied dwelling. 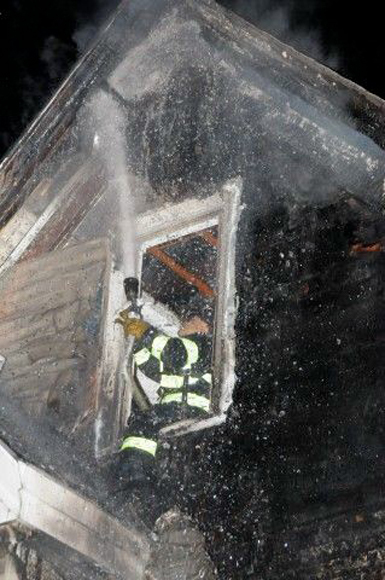 Hidden fire burning inside the wall is exposed and extinguished. 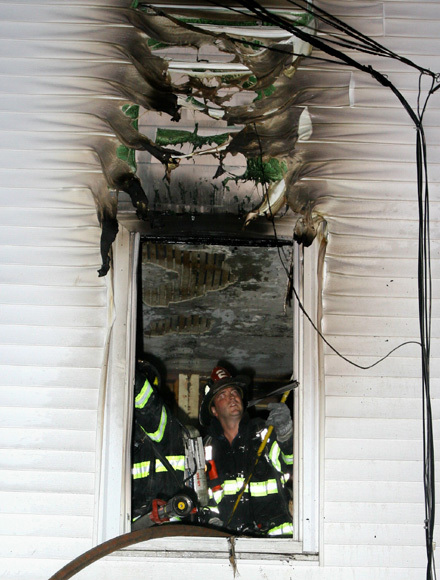 Engine 7 relocates to the interior after knocking down exterior fire. 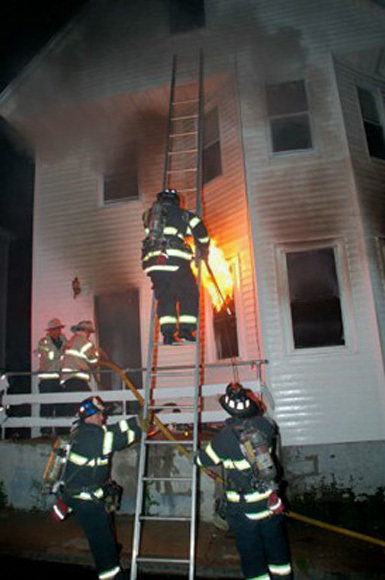 A ground ladder is raised to begin opening up the exterior wall. 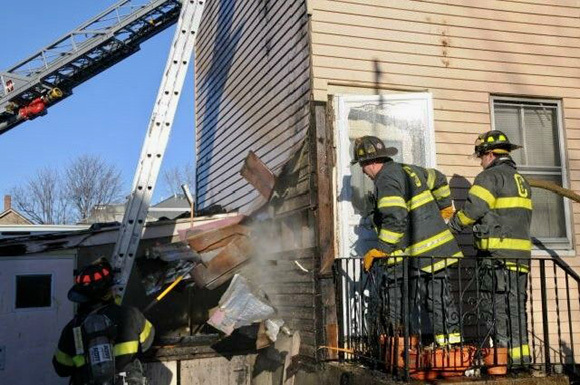 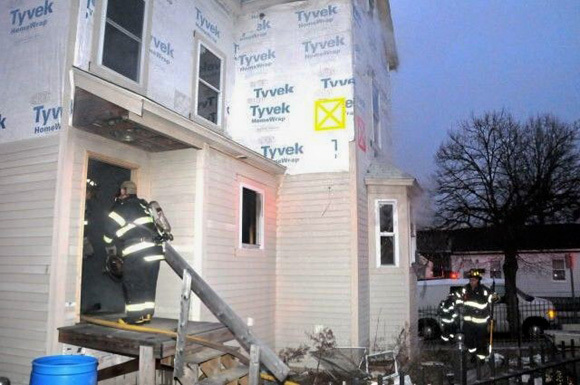 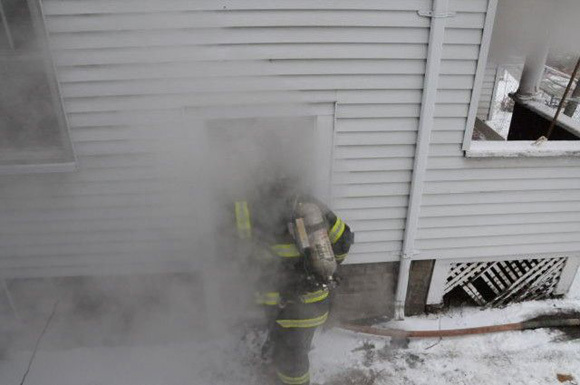 Firefighter Mark Nicholson of Ladder Two opens up the exterior wall to find hidden fire. 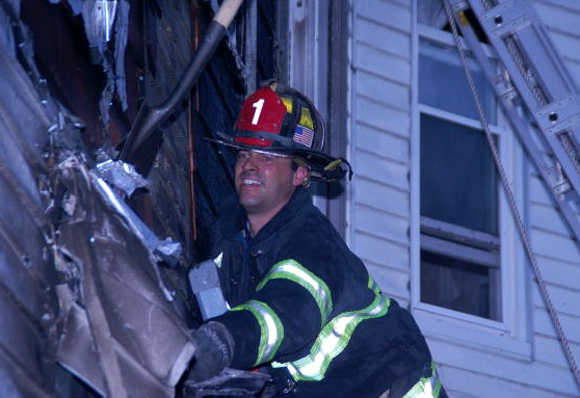 Firefighter Mark Matthews of Tower One assists in the overhaul. 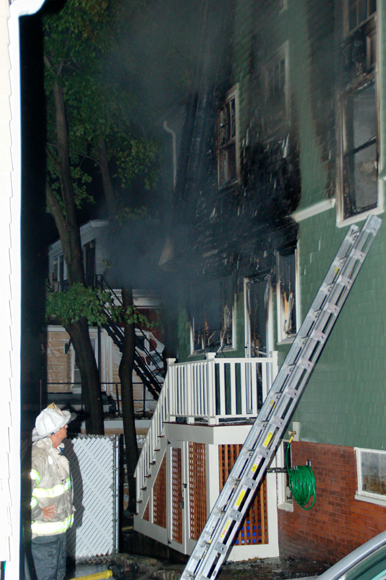 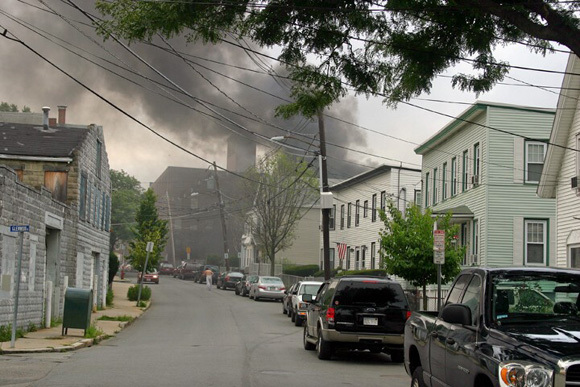 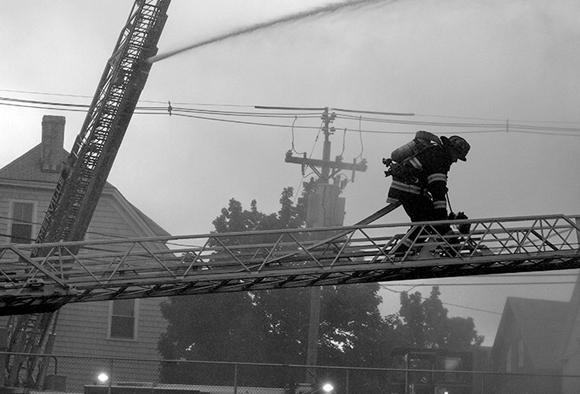 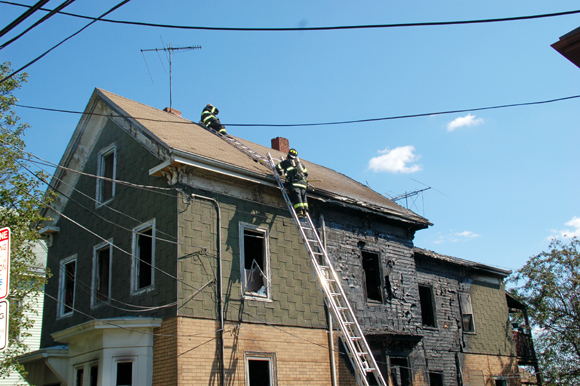 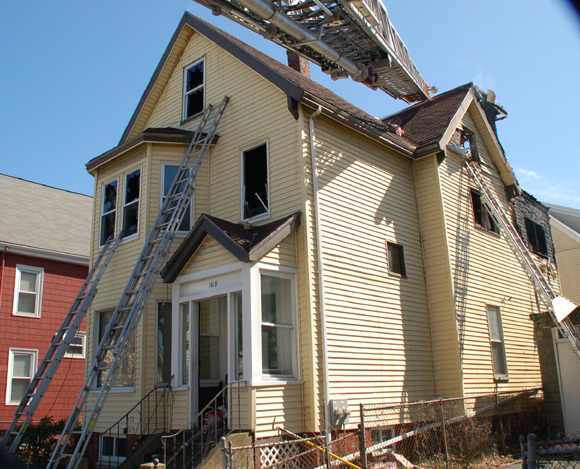 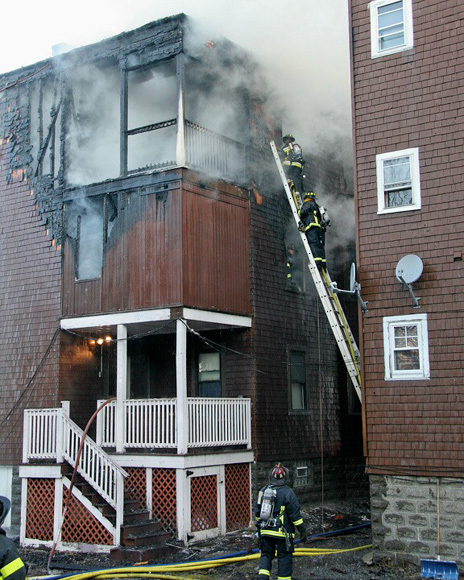 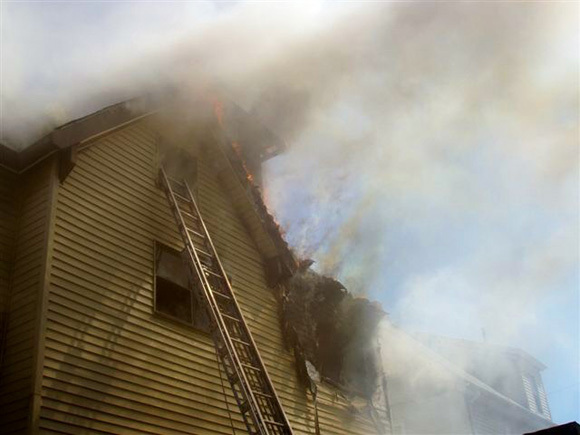 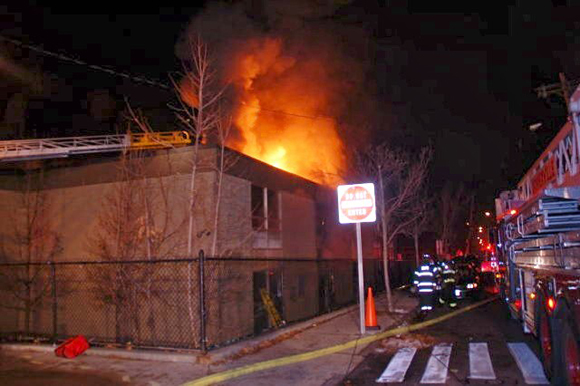 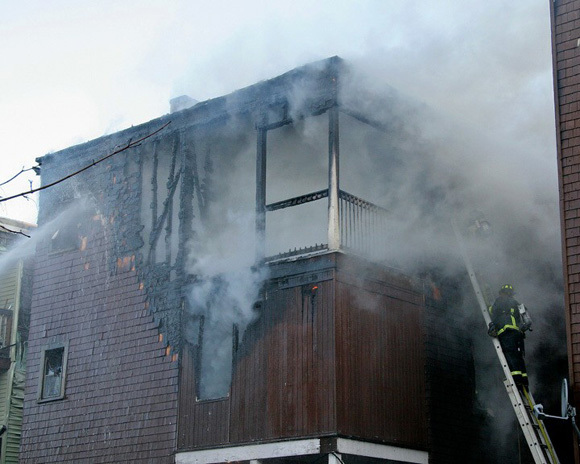 The following photos were taken at the 2nd Alarm Fire at # 26 Henderson Street on July 9th, 2007. 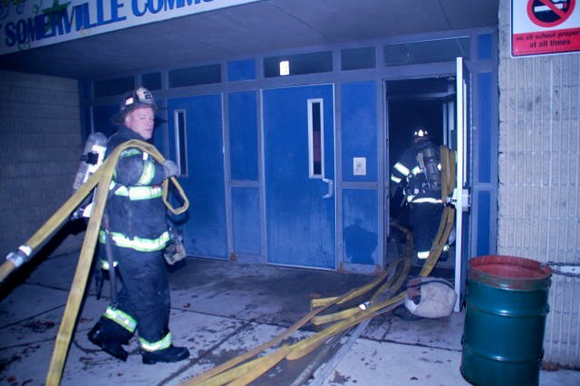 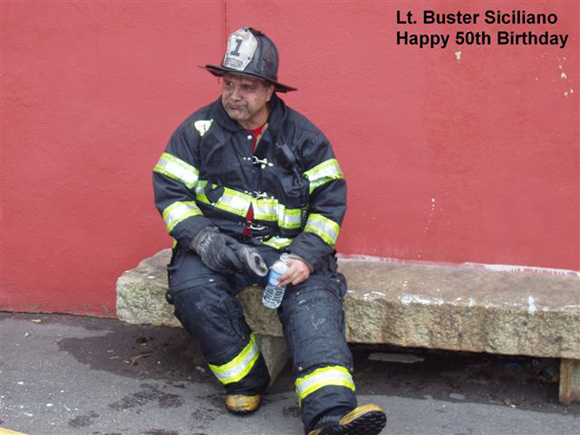 Photos by Senior Fire Alarm Operator Jim Swanton. 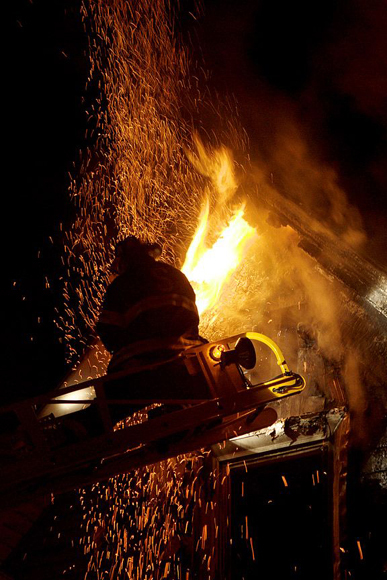 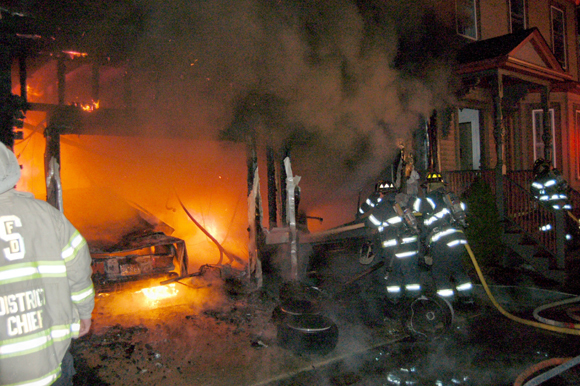 Firefighters extinguish the smoldering remains of a two car garage which was destroyed during the Second Alarm at 11 Lester Terrace on Saturday night, April 14, 2007. 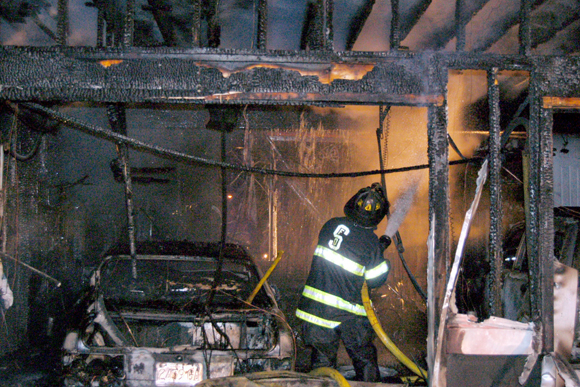 Two vehicles inside the garage were also destroyed and flames spread to the attached dwelling. 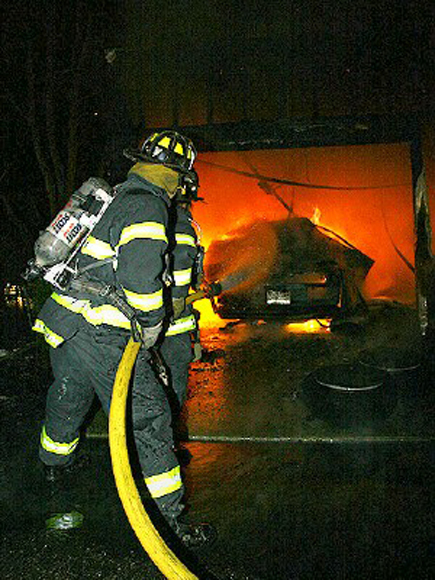 Firefighters work to extinguish the burning garage and vehicles as heavy smoke pushes from the building. 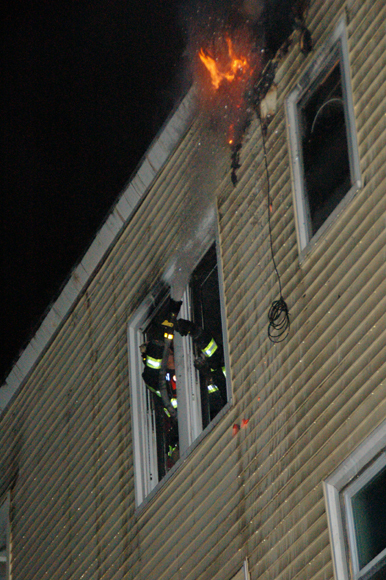 Firefighters were successful in preventing the flames from destroying the attached dwelling. 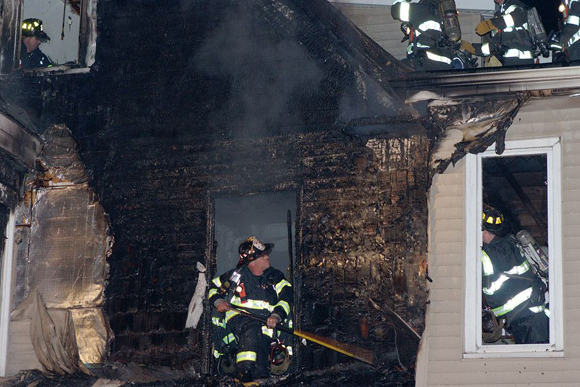 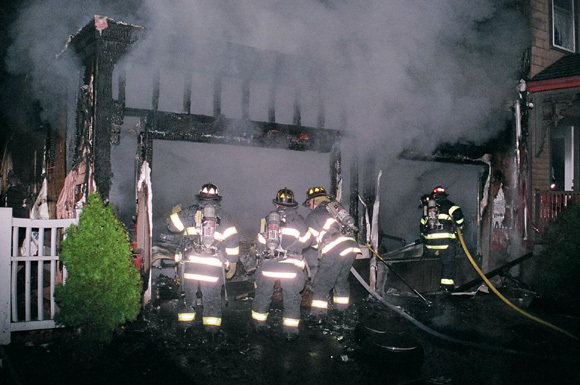 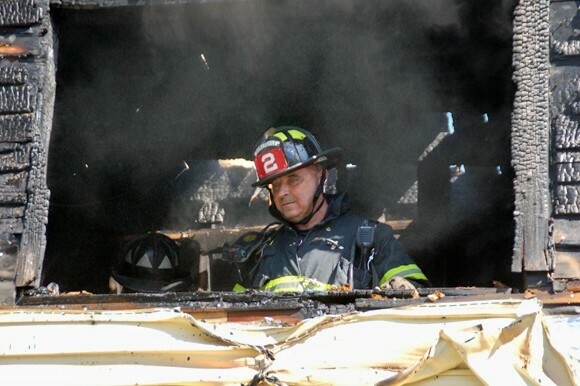 Lt. Steve Ortolani views damage that heat from the blazing garage caused to Engine Six's pump. 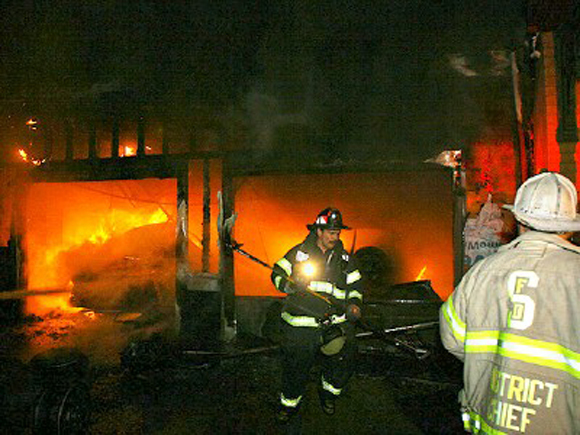 Flames bursting out the front of the garage caused damage to the paint, melted several lights and cracked several windows. 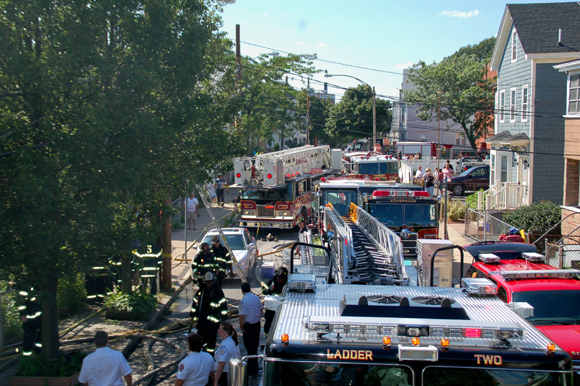 Lester Terrace is a tightly congested, dead end street. 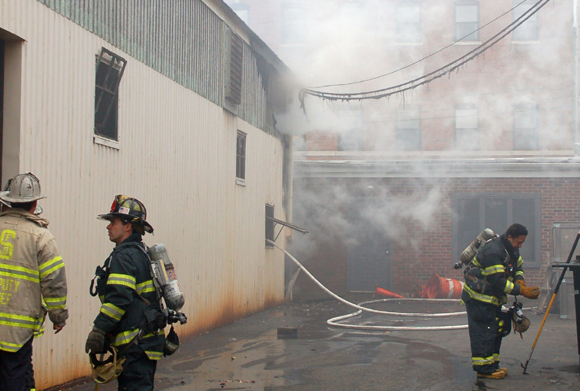 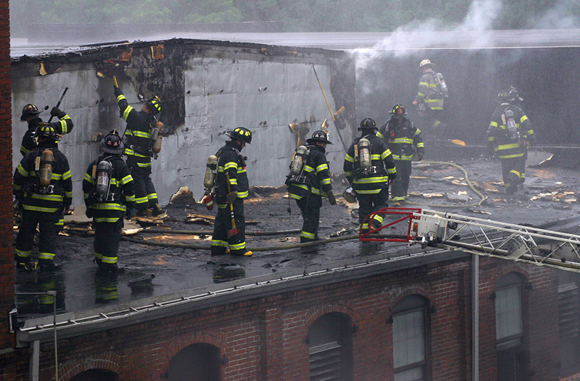 Deputy Chief Steve Keenan directs a company to knock down the exposure fire next to 121 Temple Street. 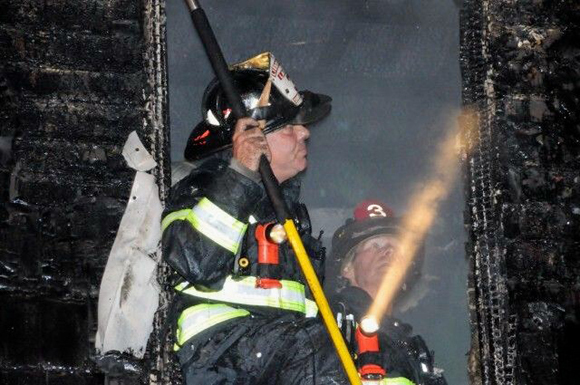 Deputy Chief Steve Keenan (left) and Fire Chief Kevin Kelleher (right) direct exterior operations during the 3 Alarm fire. 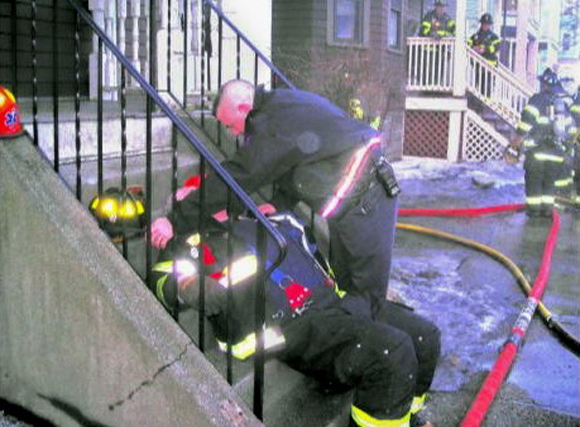 Firefighter Kenny Layton of Ladder 2 is treated for injuries by a Cataldo EMS worker after he was struck by falling debris at the fire. 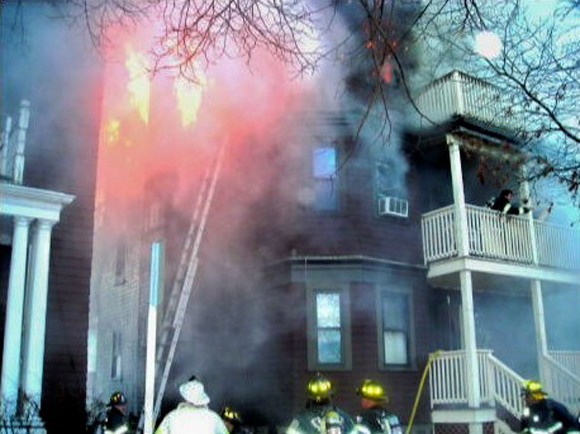 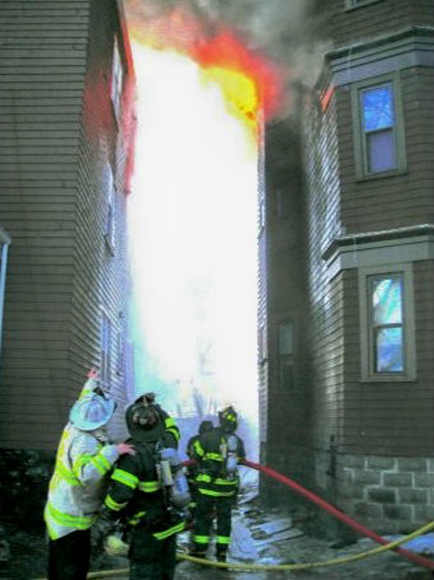 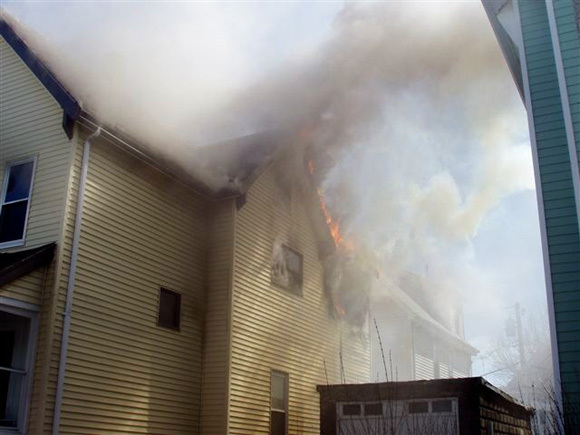 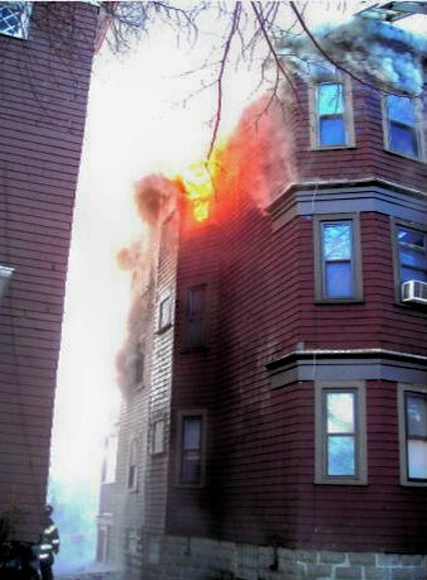 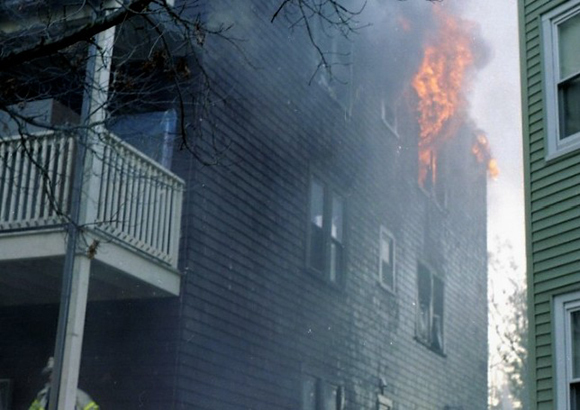 Heavy fire conditions greeted first arriving companies during a 2nd Alarm fire at 10 Pinckney St. on the afternoon of December 21st, 2006. 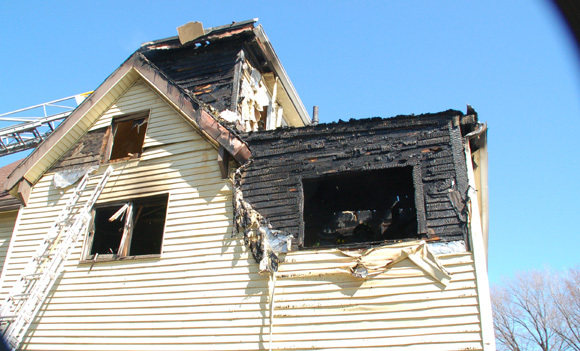 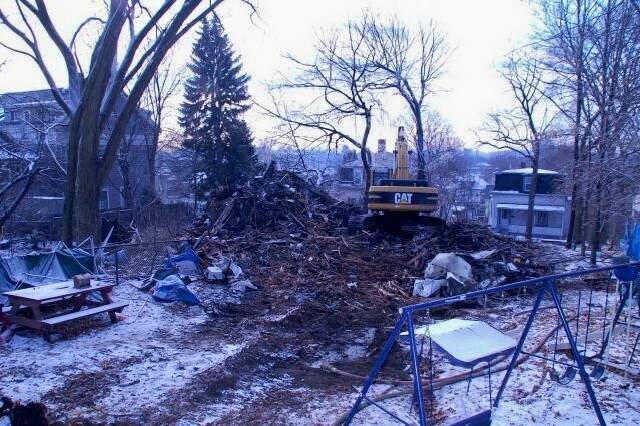 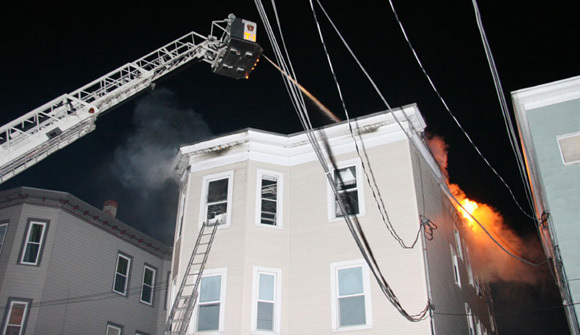 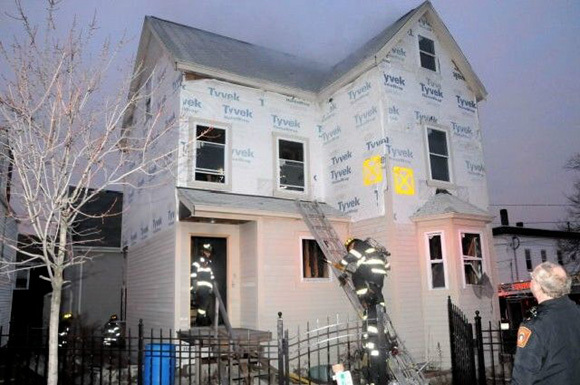 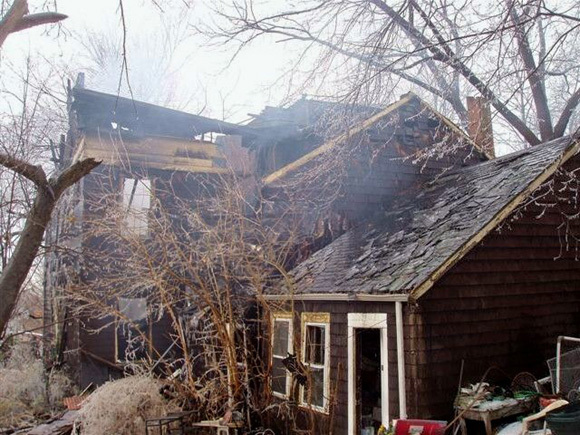 The second floor rear of the two story dwelling was heavily involved and as is most often the case in this city, an adjacent dwelling was severely exposed and started to ignite. 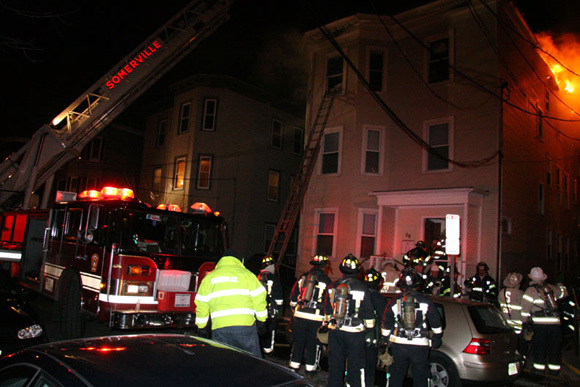 Not only was Engine 4 out of service as usual, but Engines 6 & 7 were committed to other incidents at the time of the 2nd Alarm and were unable to respond. 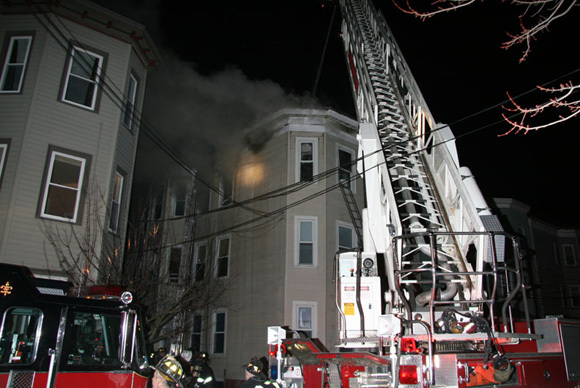 Fire Alarm was forced to rely upon out of town companies to back up the first alarm companies who were heavily engaged and trying to keep the fire from spreading to additional homes. 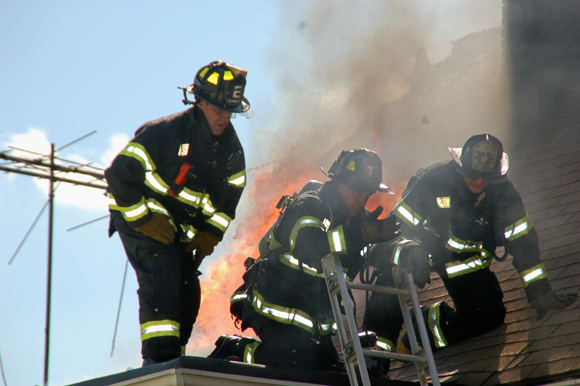 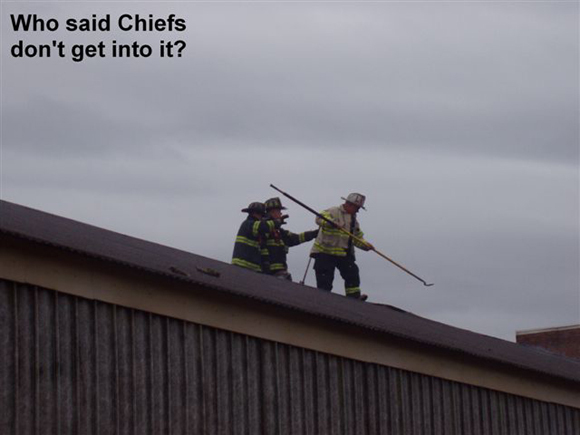 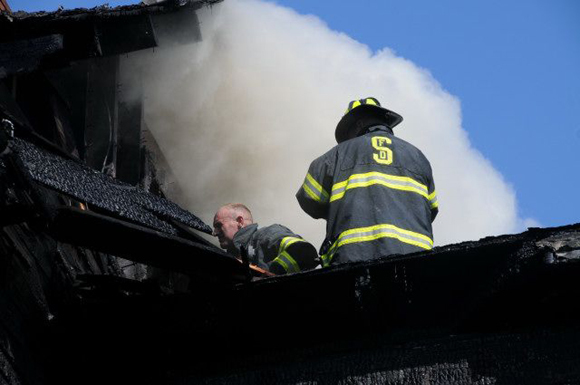 Firefighters work to open the roof and get ahead of the rapidly advancing fire in the cockloft. 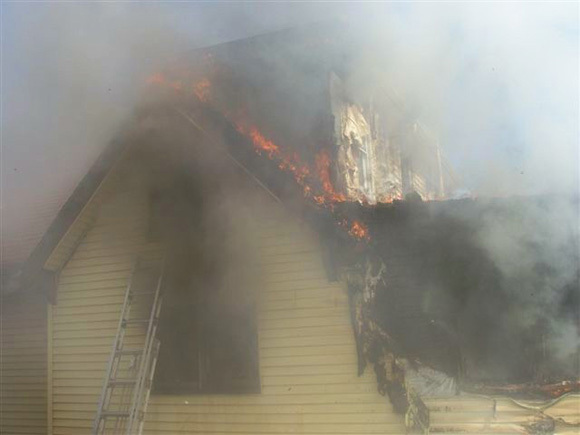 The two story home was unoccupied at the time of the fire which spread through the walls and ceilings of both floors. 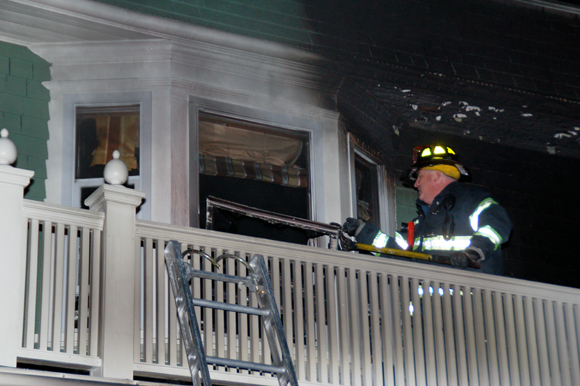 The adjacent house at # 12 Pinckney Street suffered exterior fire damage.